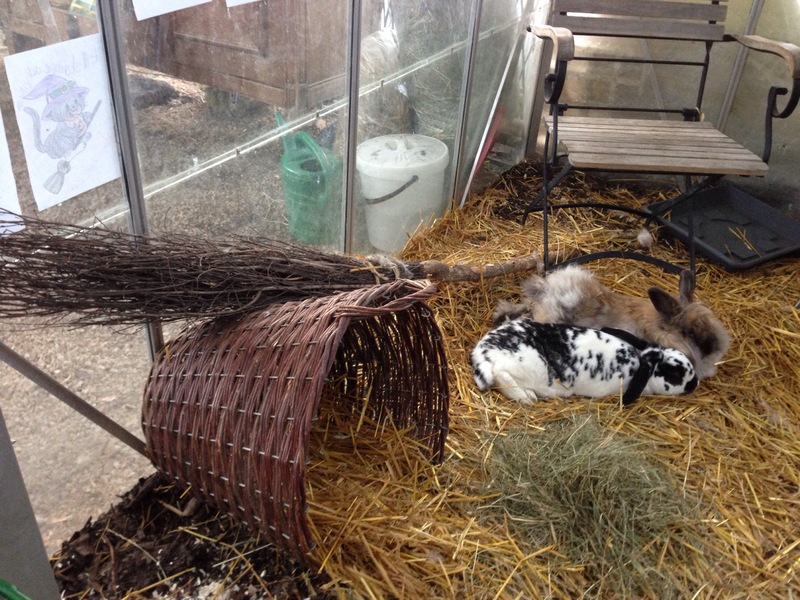 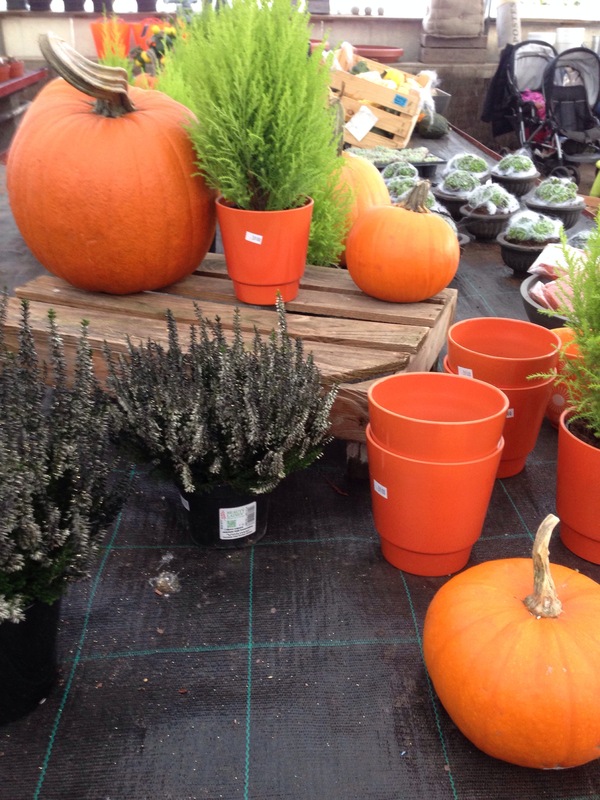 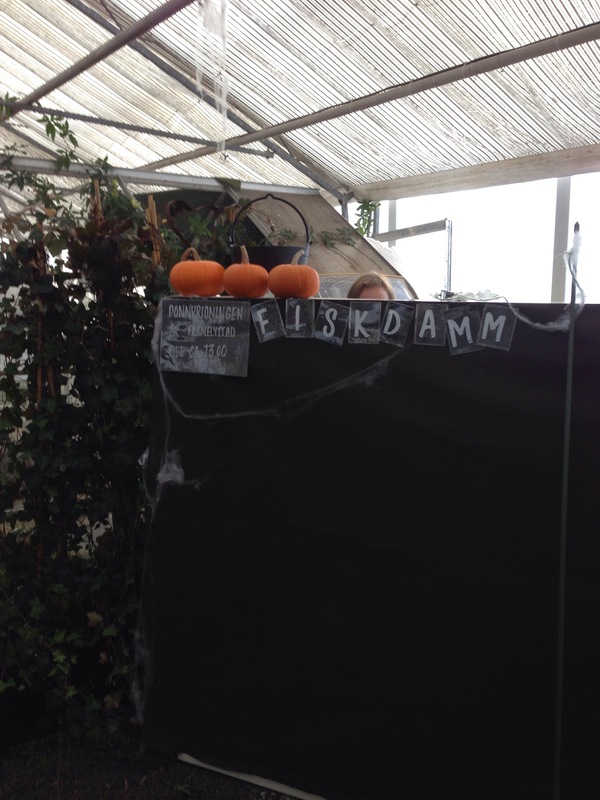 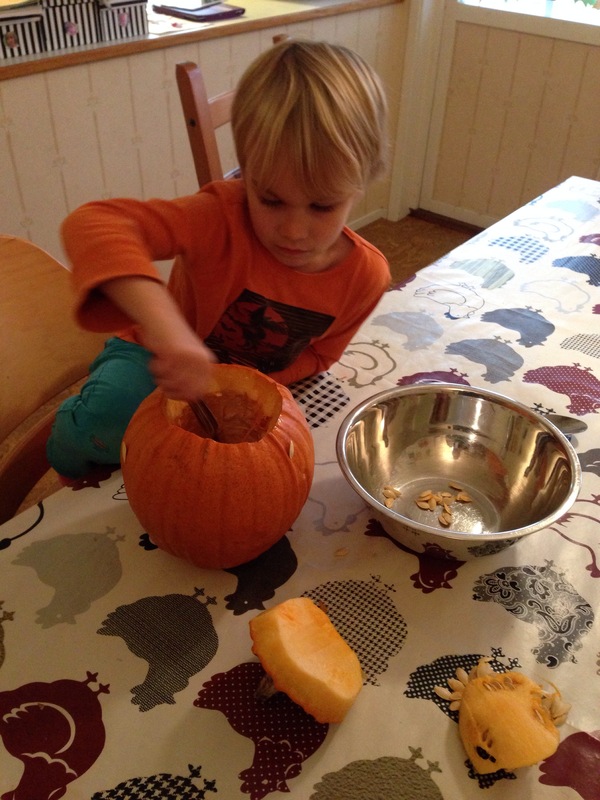 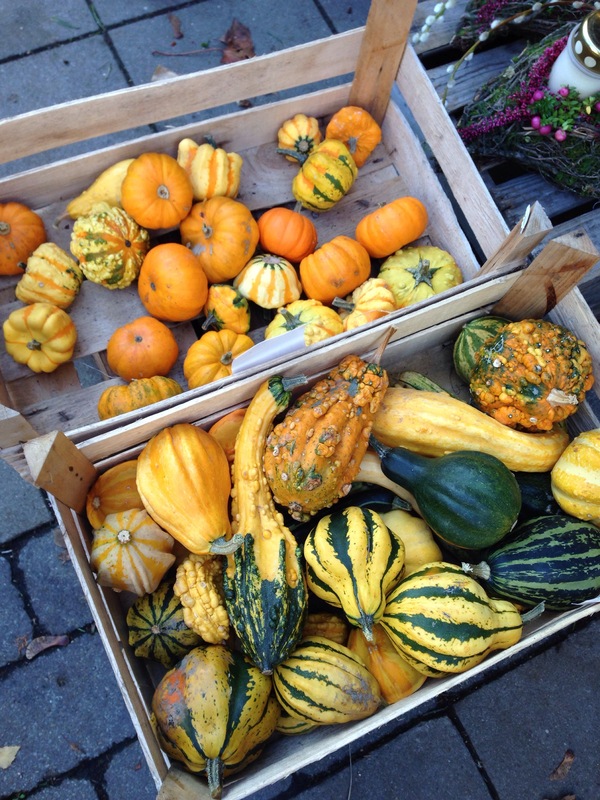 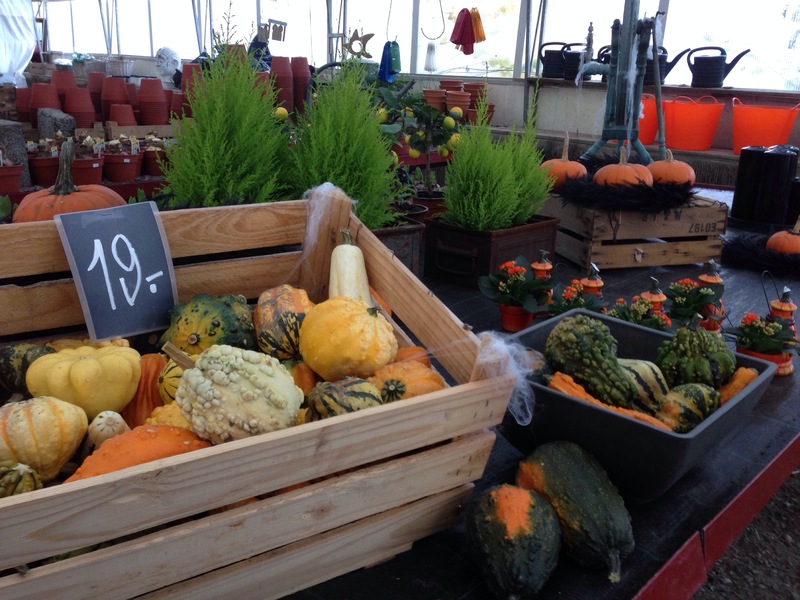 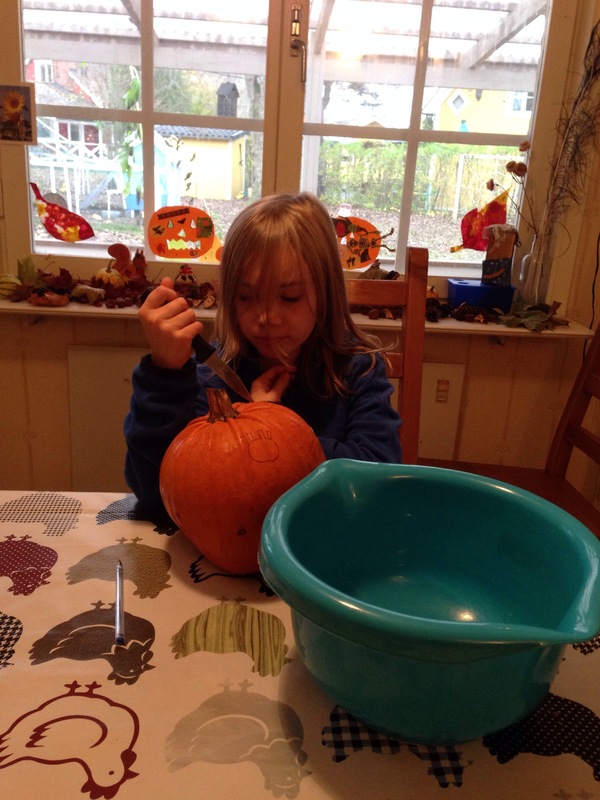 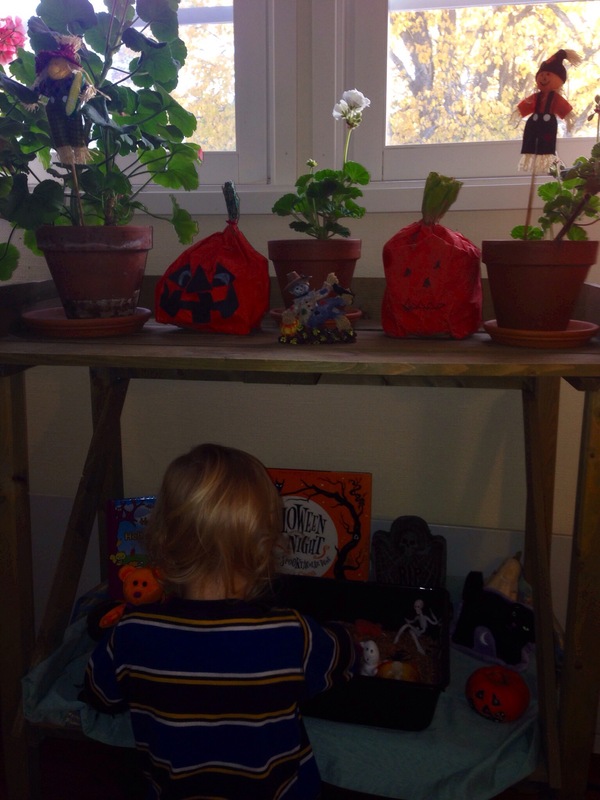 ….and a homemade pumpkin patch…. 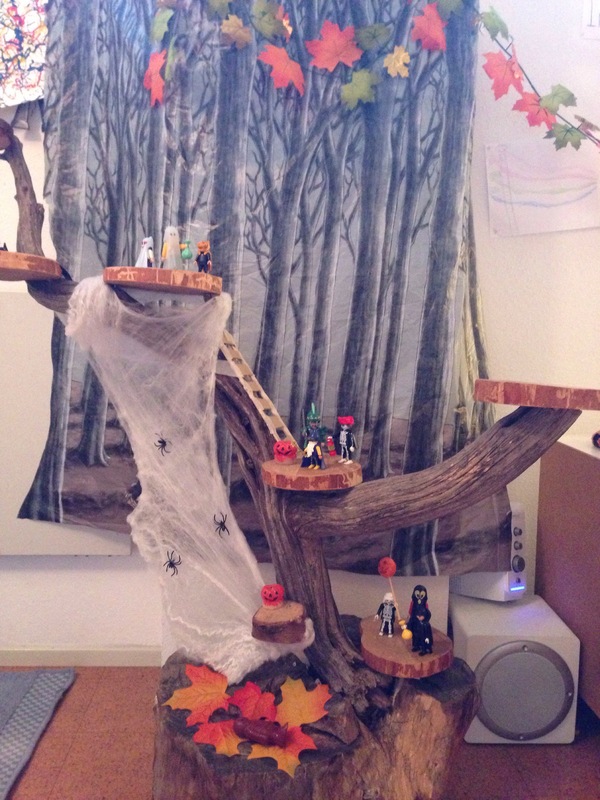 We found this beautiful piece of wood sometime ago, and the kids fantastic grandad made it in to a small world tree house for them. 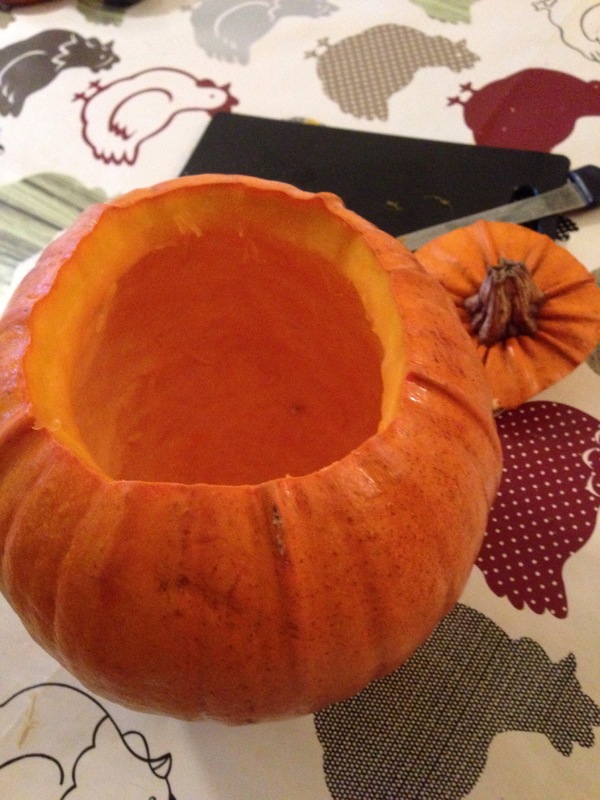 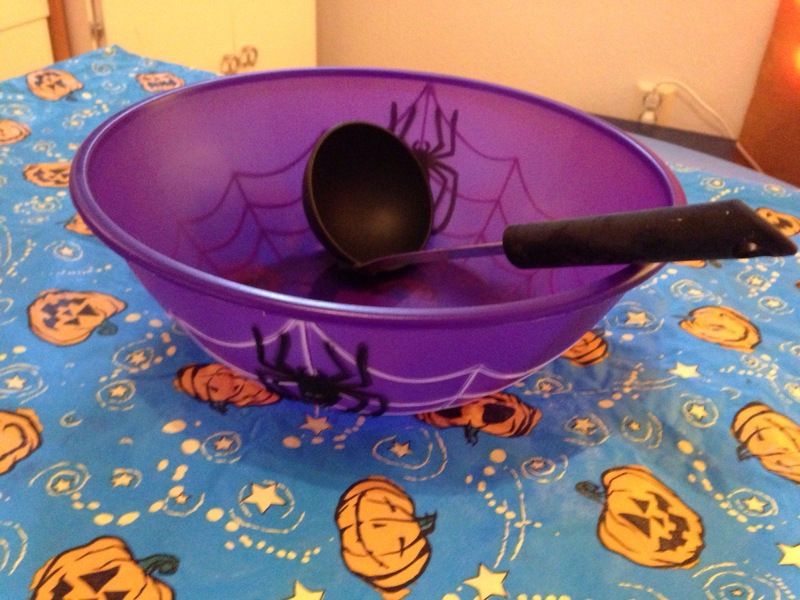 Now the trick or treaters caught sight of it…. 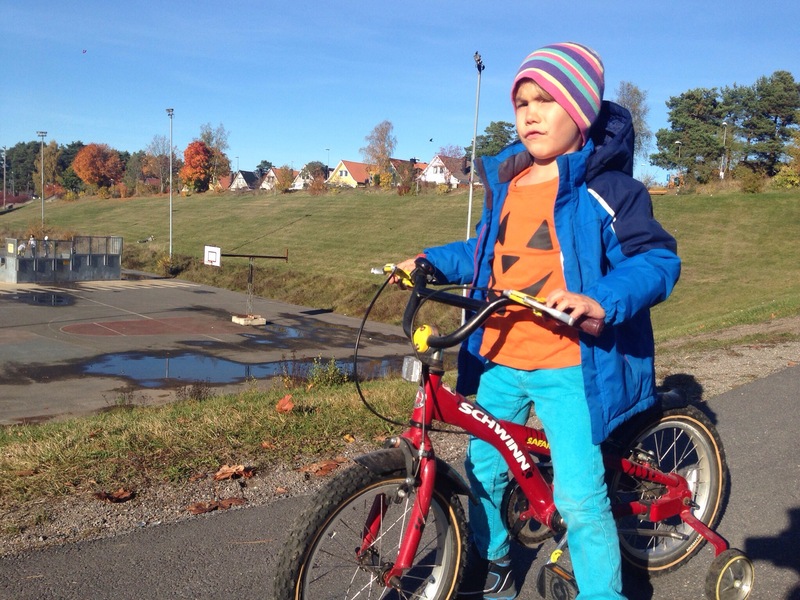 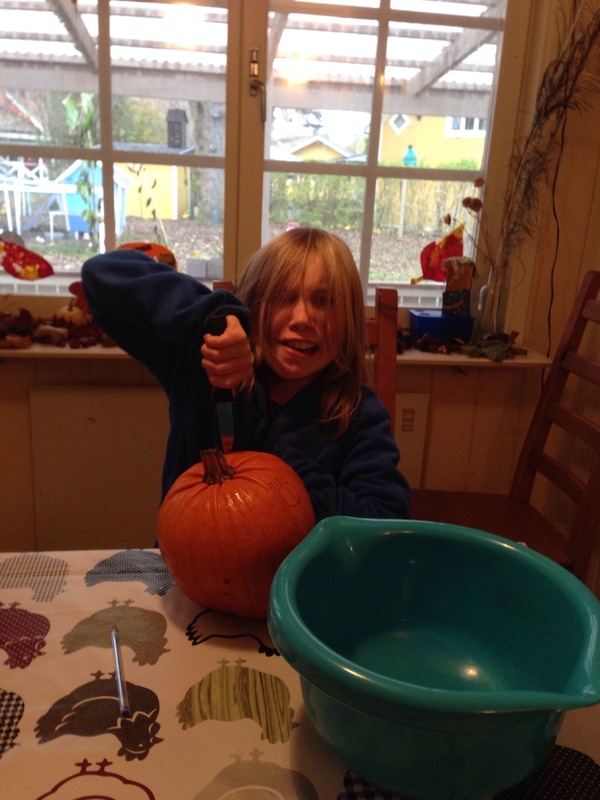 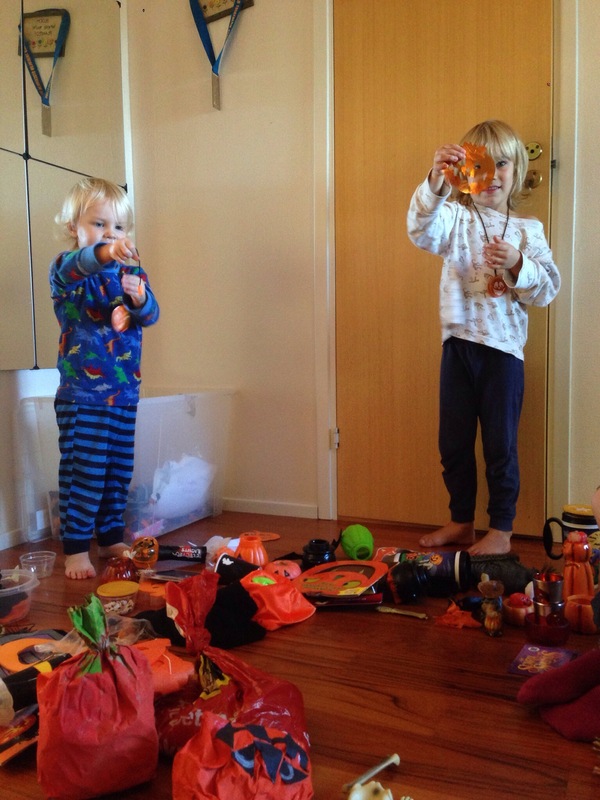 “Trick or treat!” – or “bus eller goodies” as they say in these parts!….. 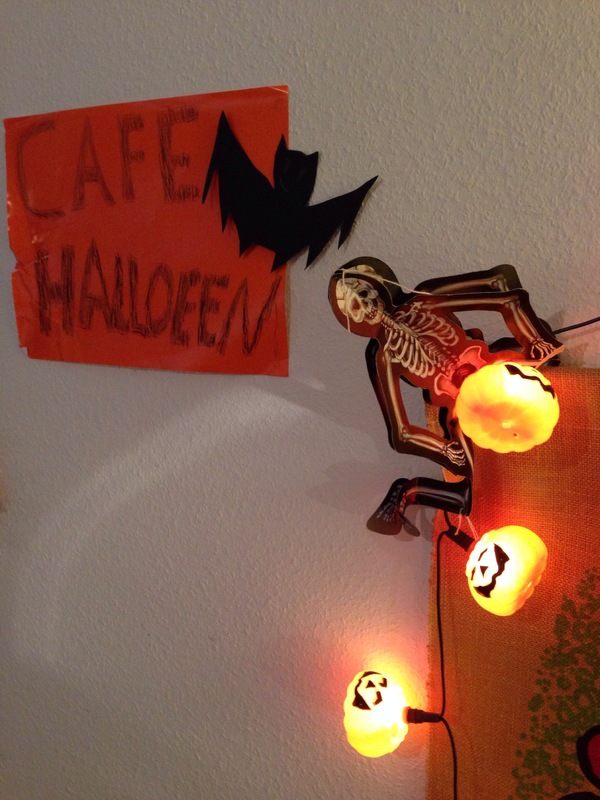 Welcome To Our Halloween Cafe! 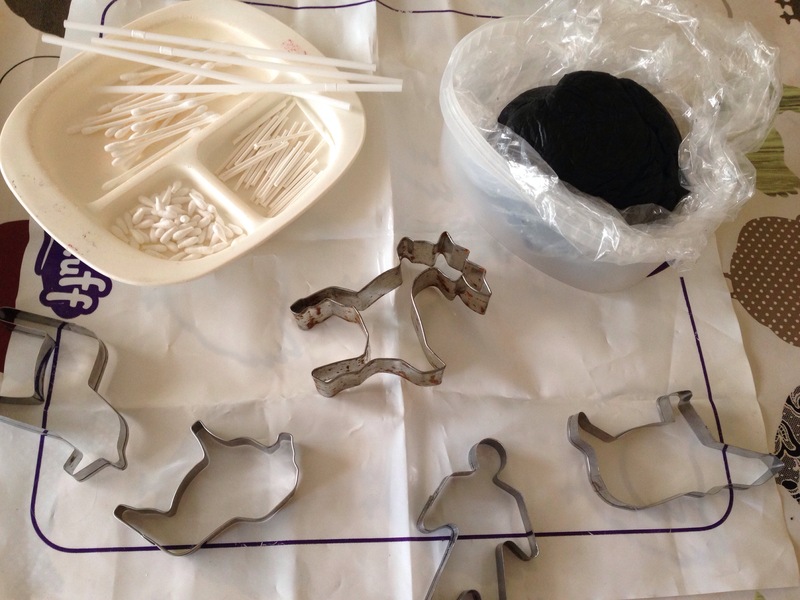 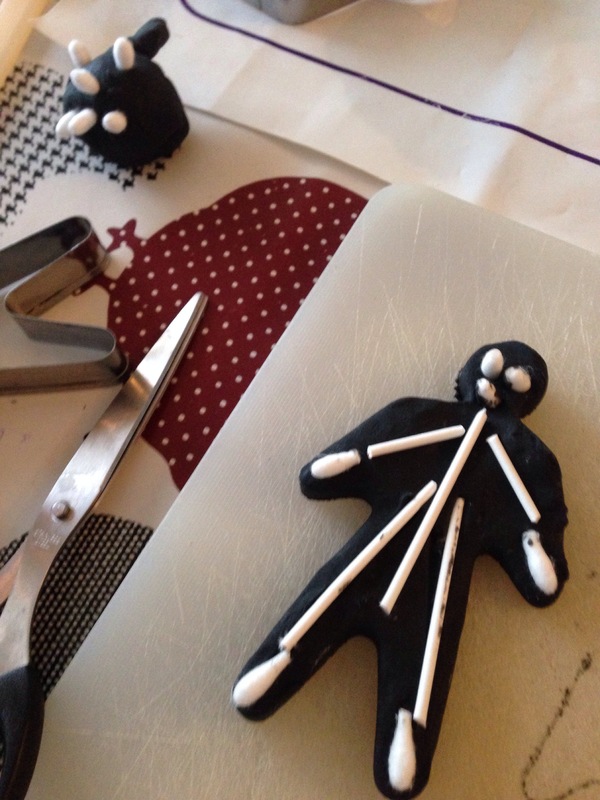 Of perhaps you just fancy being whipped up a spooky shaped cookie..? 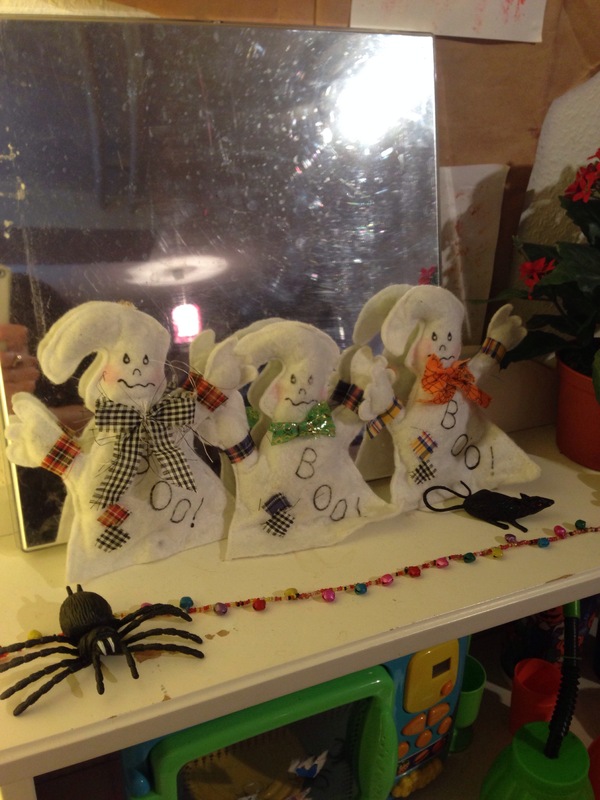 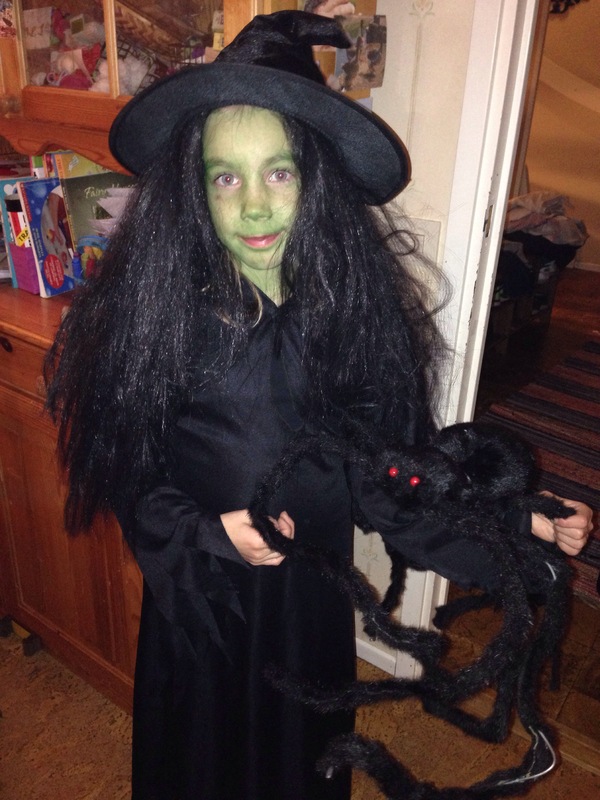 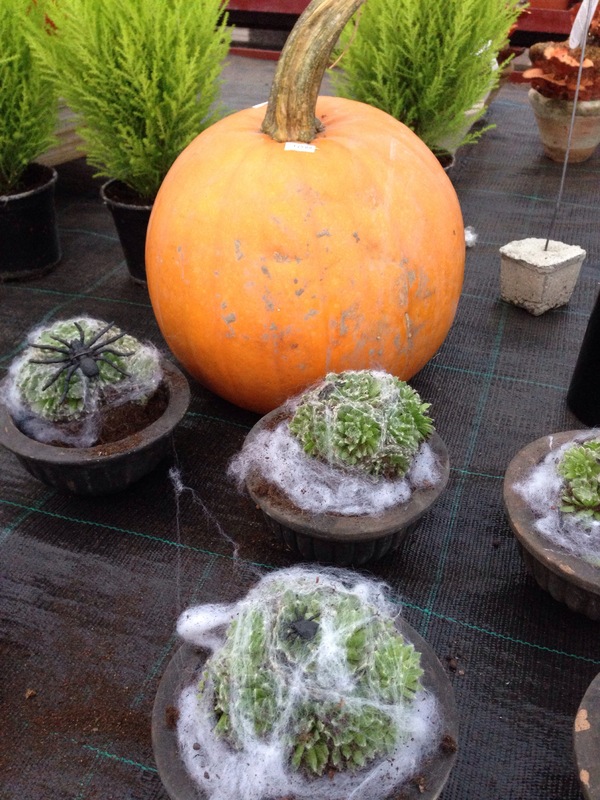 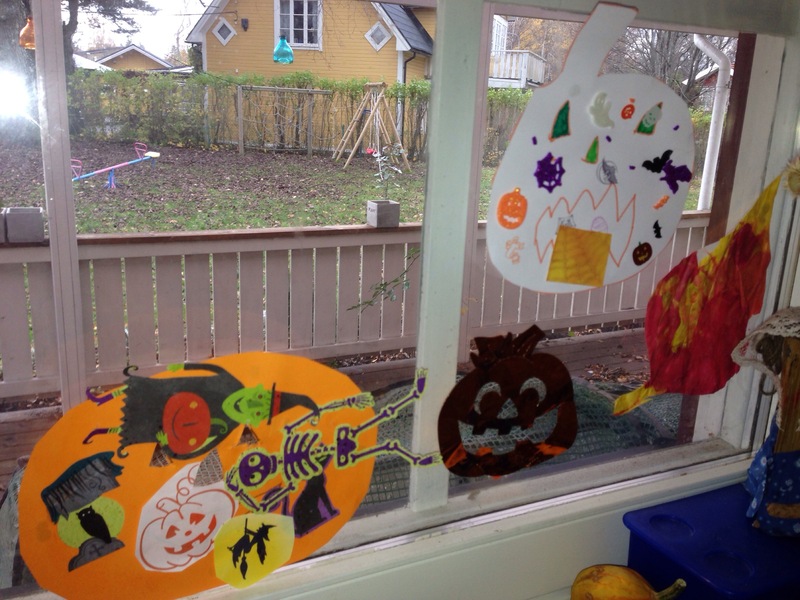 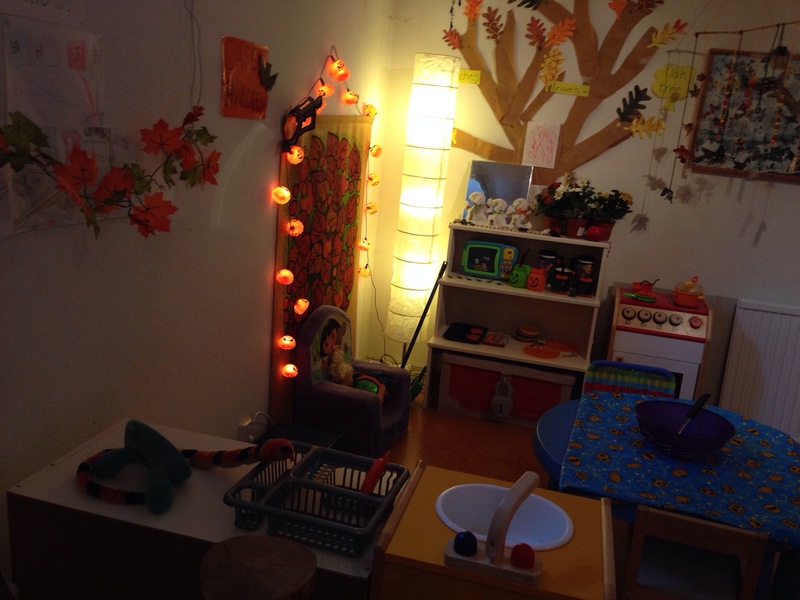 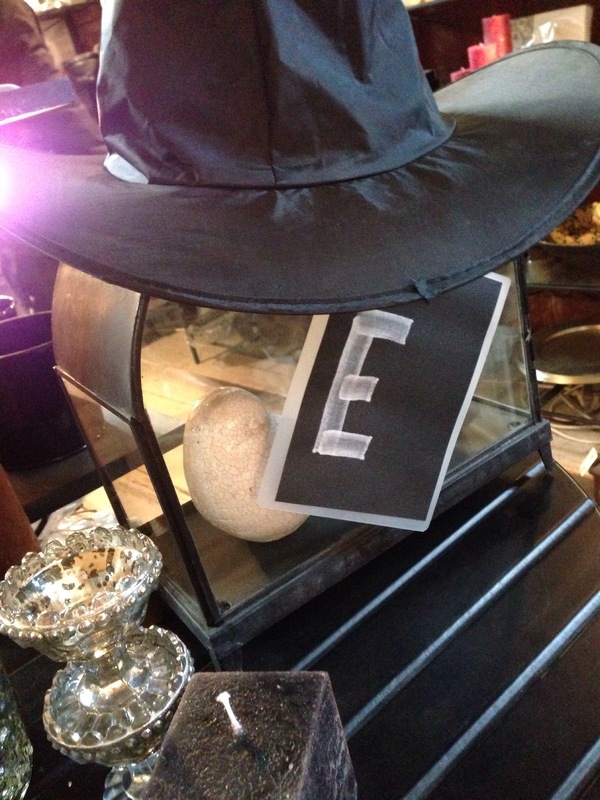 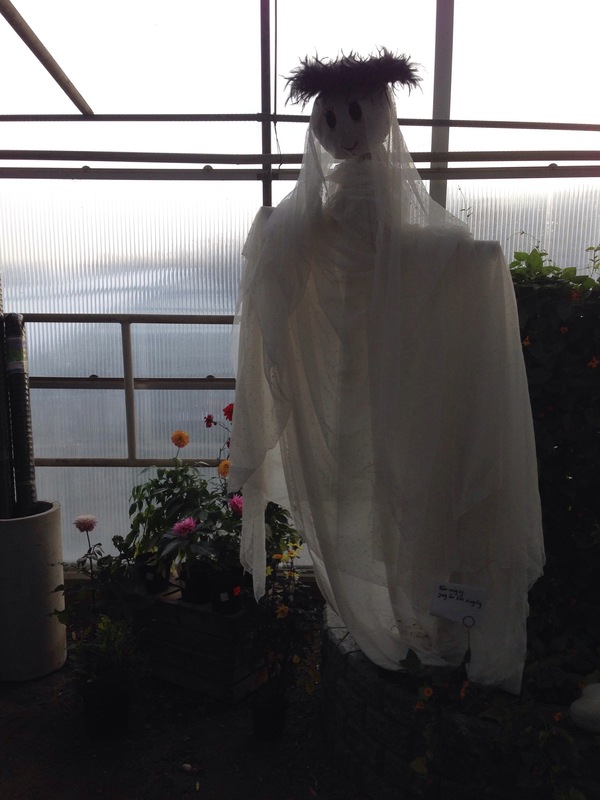 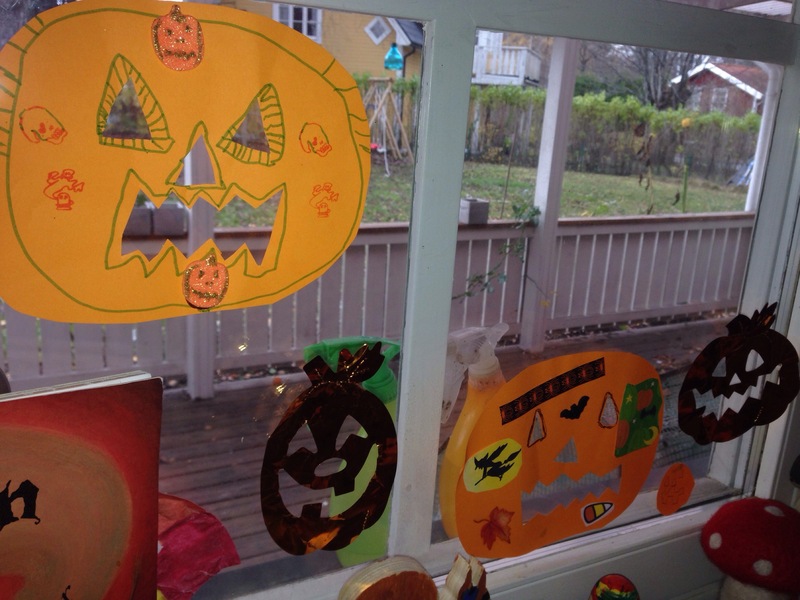 Watch out for the ghosts…..
…let’s hope you survive our Halloween Cafe…! 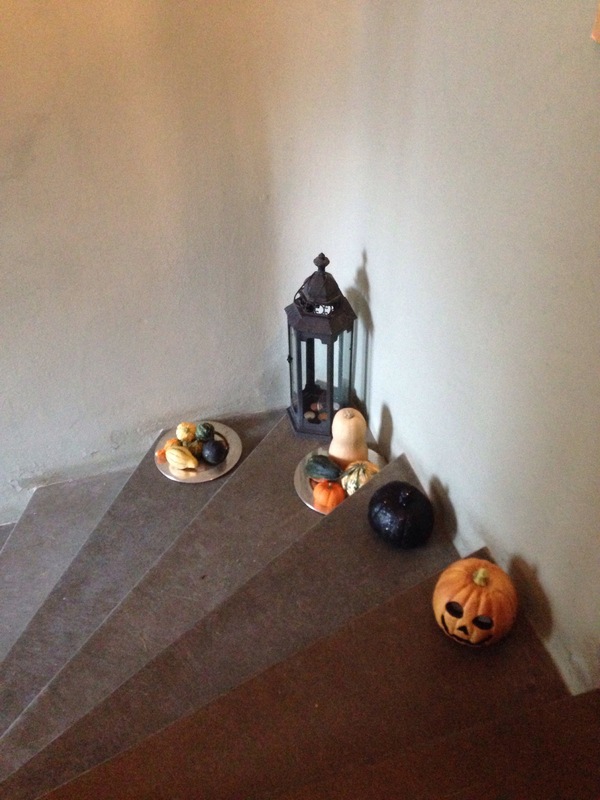 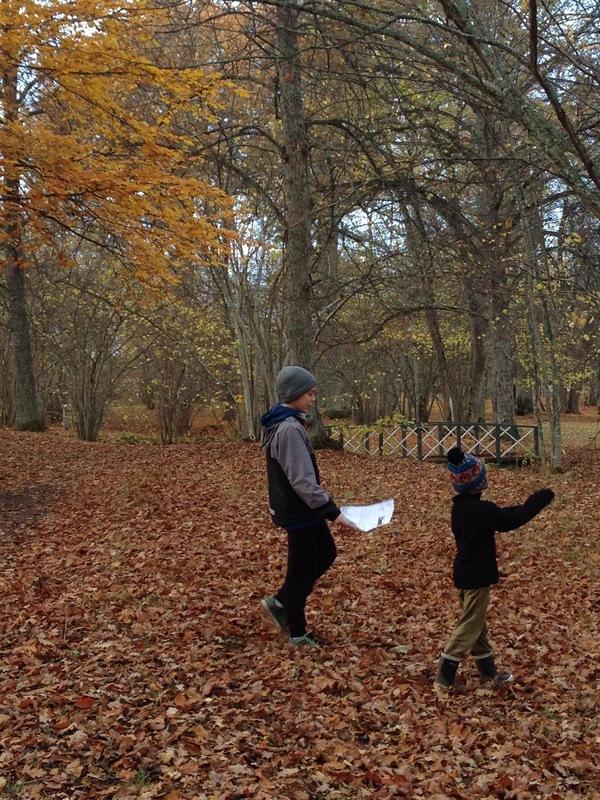 The lady told us to follow the map and look out for ‘Halloweeny objects’ – and there we would find a letter. 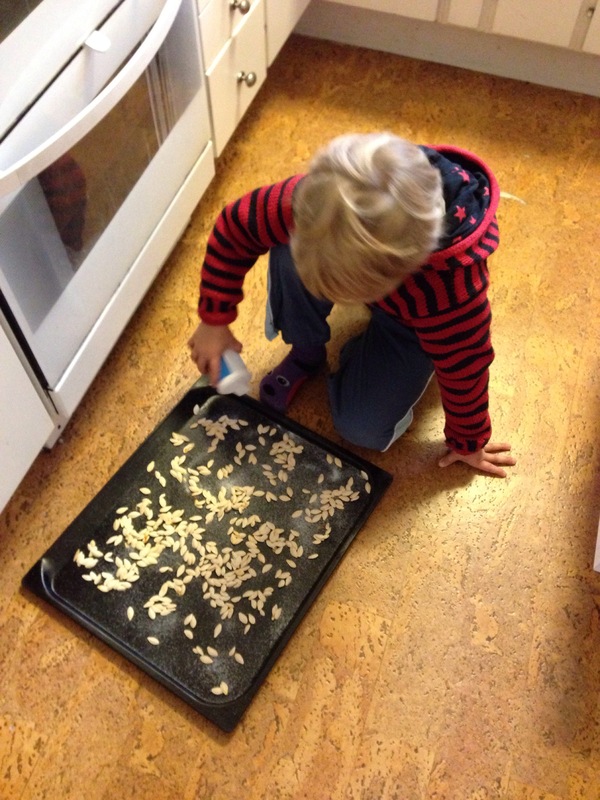 When we had collected all the letters we had to sort them to make a word – and find the treasure. 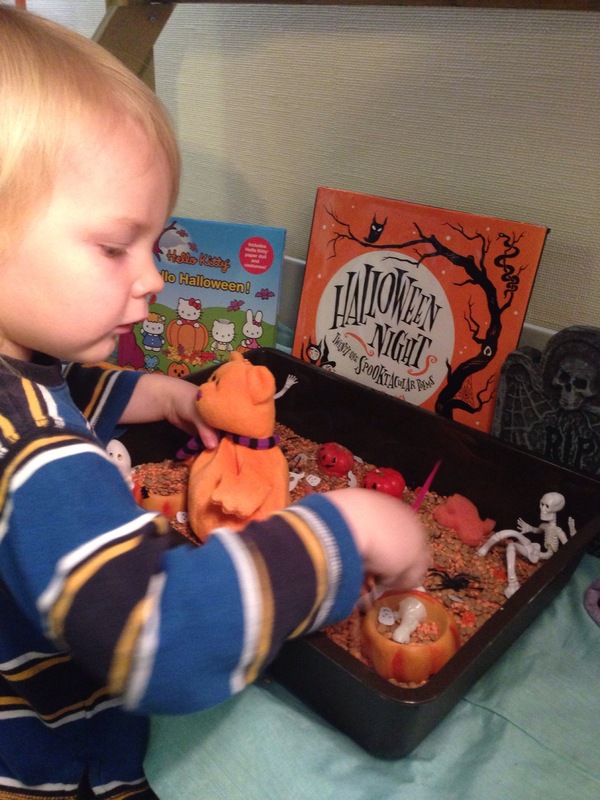 In the above picture Alfie is telling the lady he’s already found one – the pumpkin on her table! 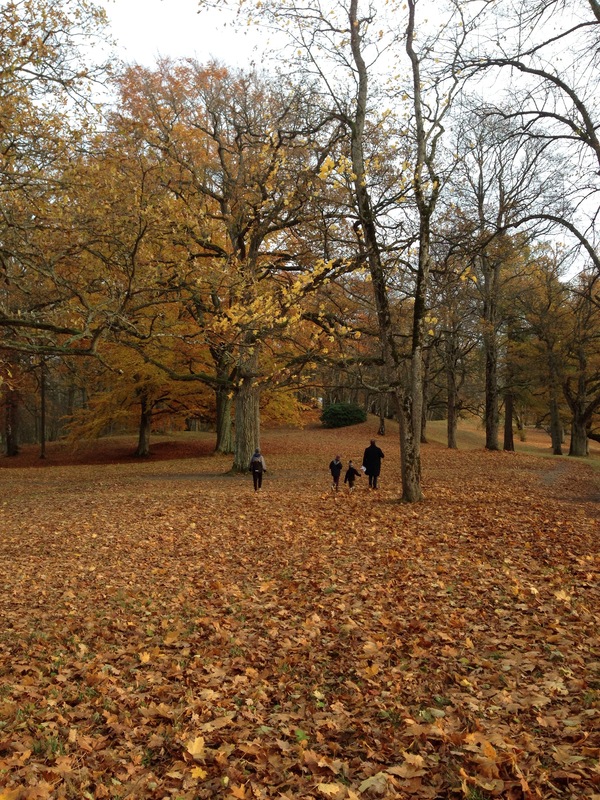 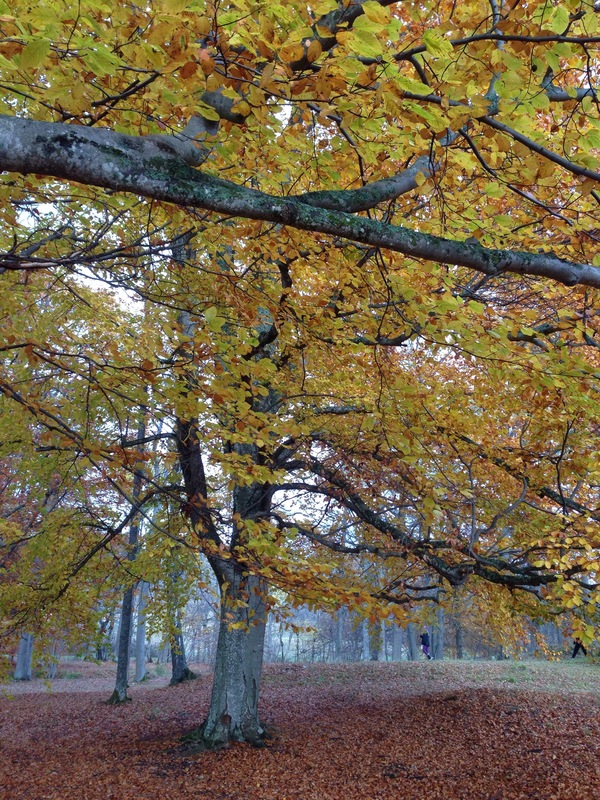 Still the searching continued outside in the gardens – which were stunning due to all the autumn leaves…. 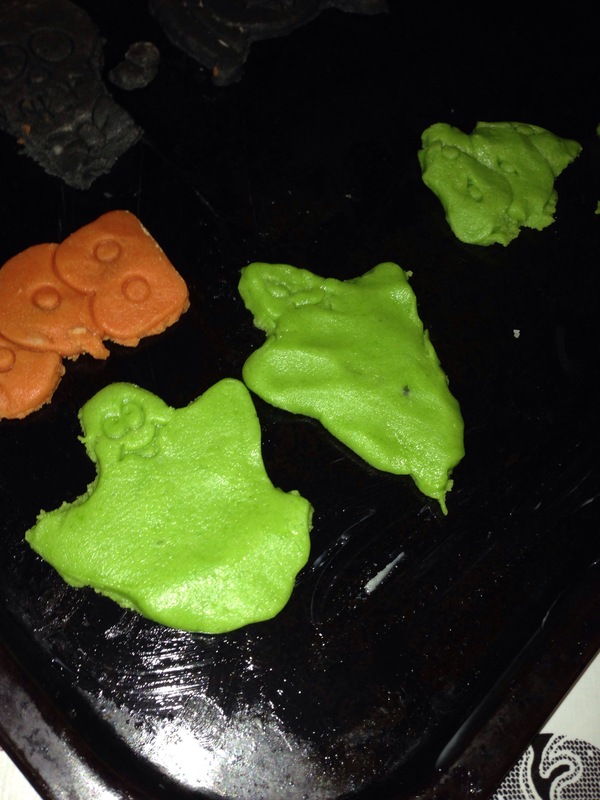 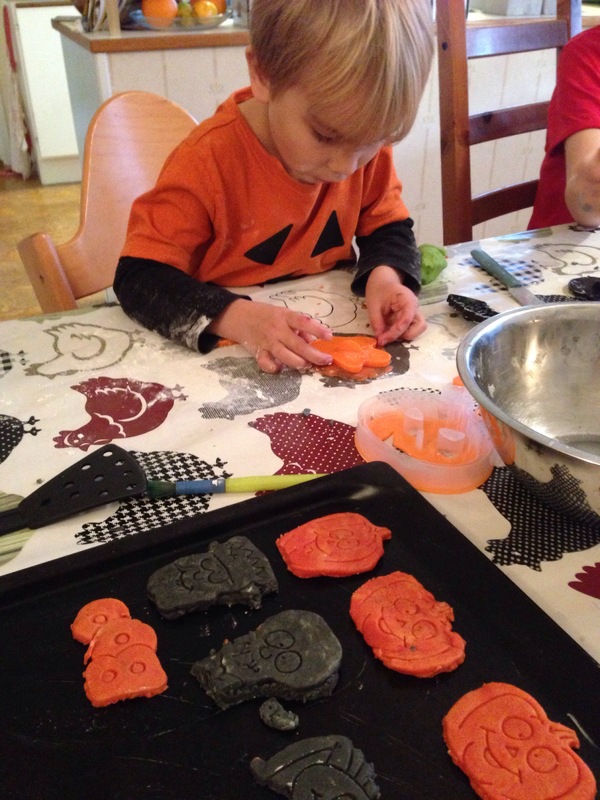 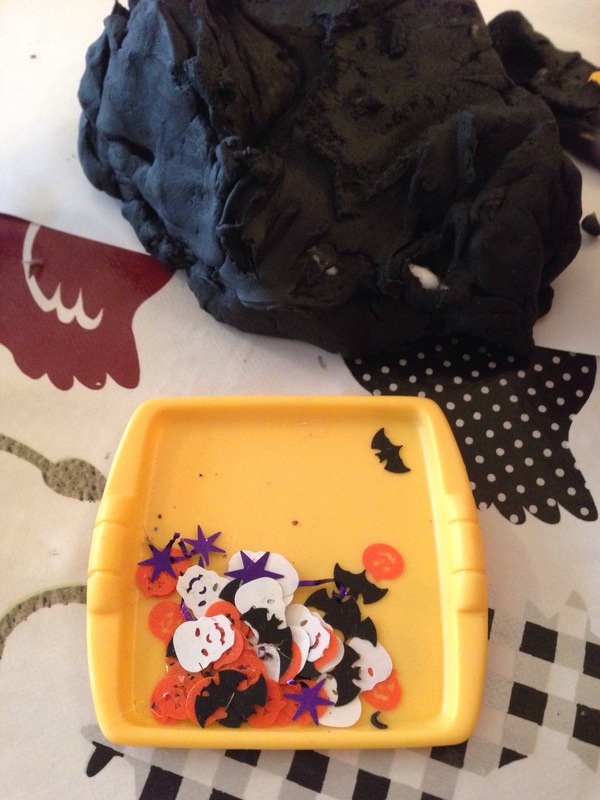 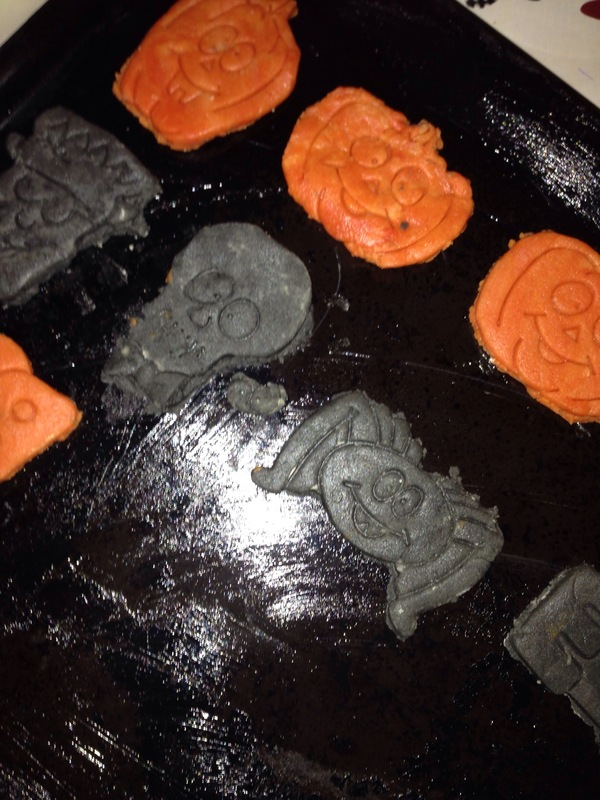 Halloween celebrations are taking off in the home now..
….and the Halloween cookies with three different colours of cookie dough (plus skeletons of course!)…. 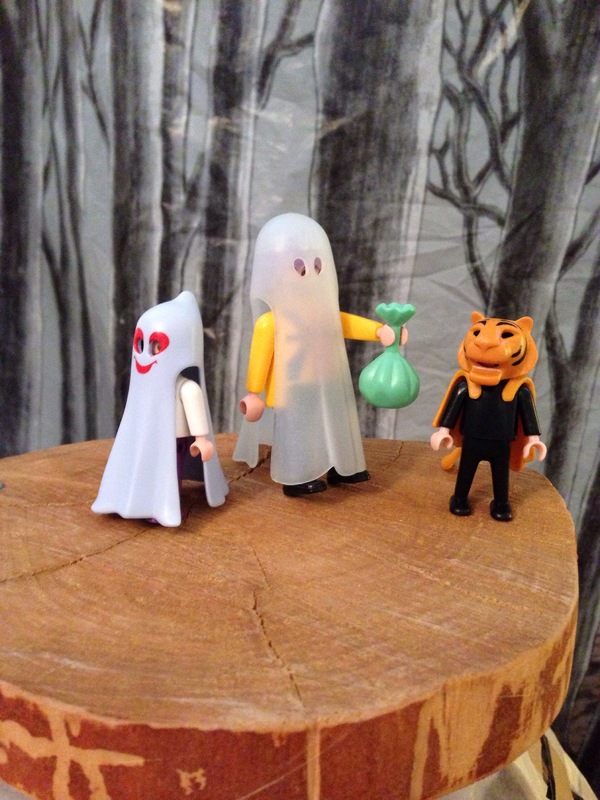 …and a green ghost to boot! 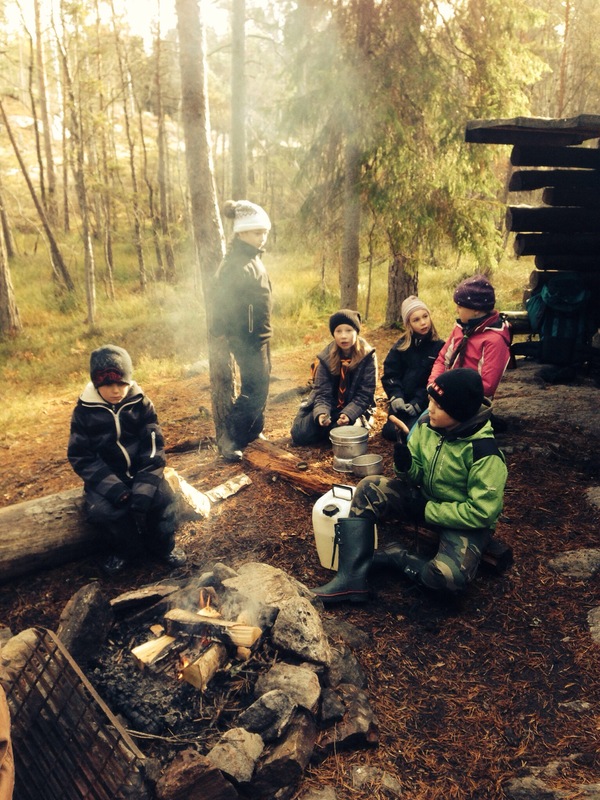 It might be the last overnight camp of this autumn – the frost covers the ground every morning now, and the temperature at that time is in the minuses. 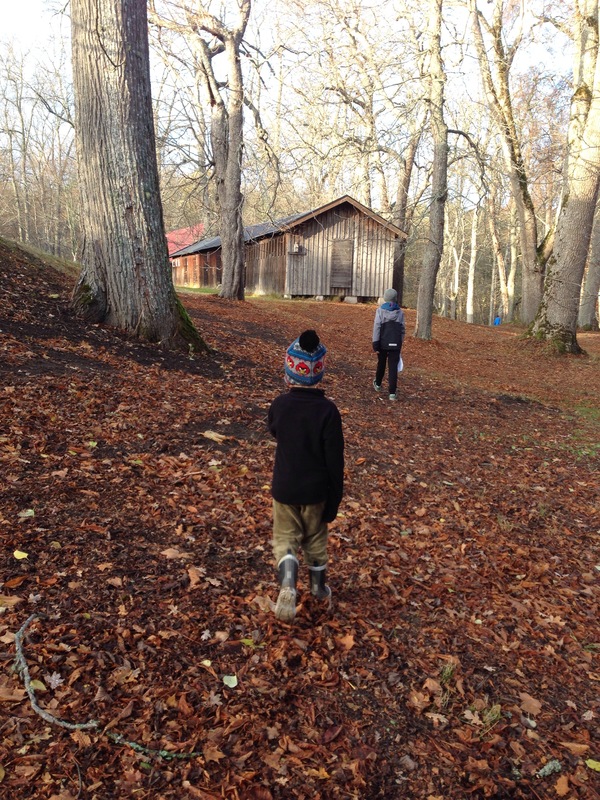 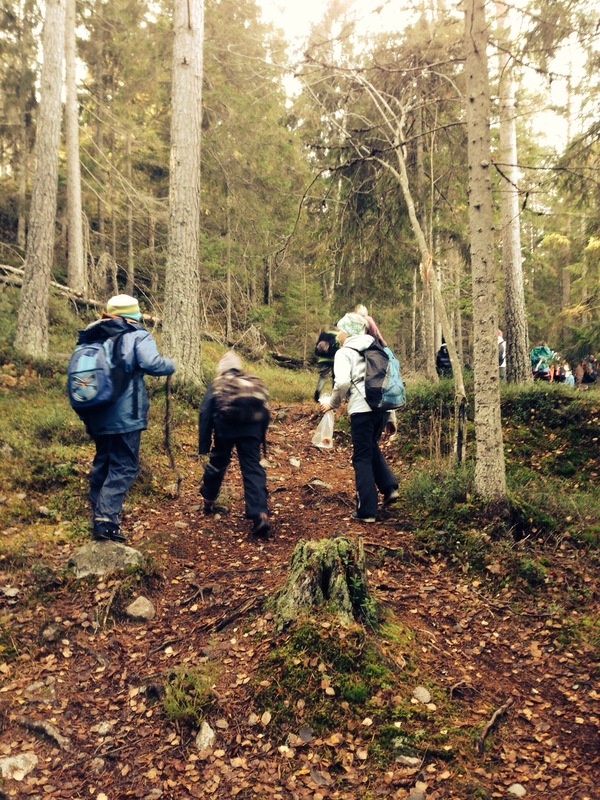 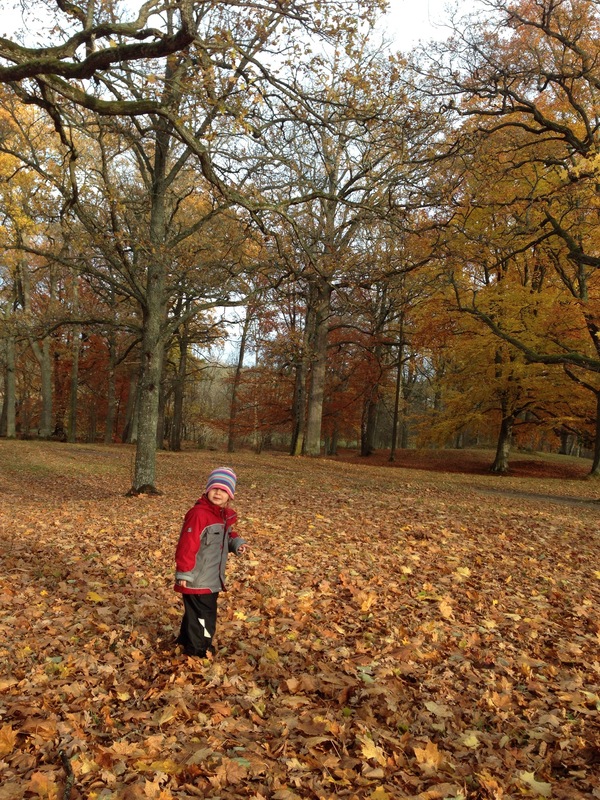 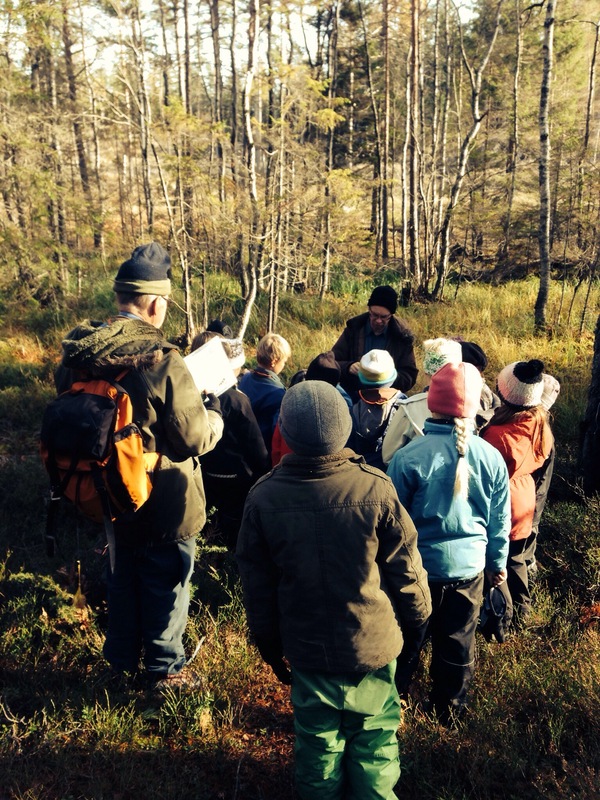 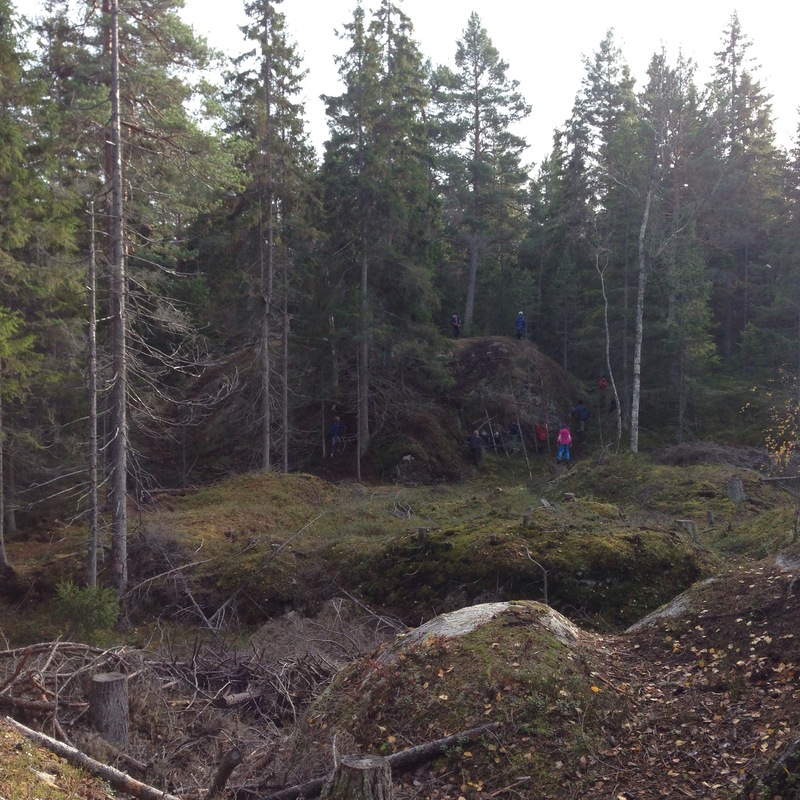 …before we set off on our hike through the forest…. 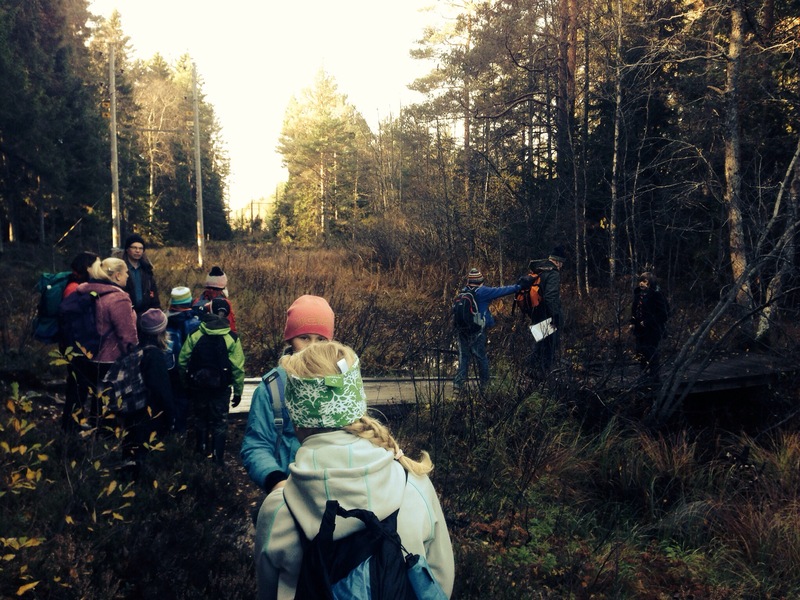 …and there would be no crossing the bridge until each one of us could point out where we were on the map…. 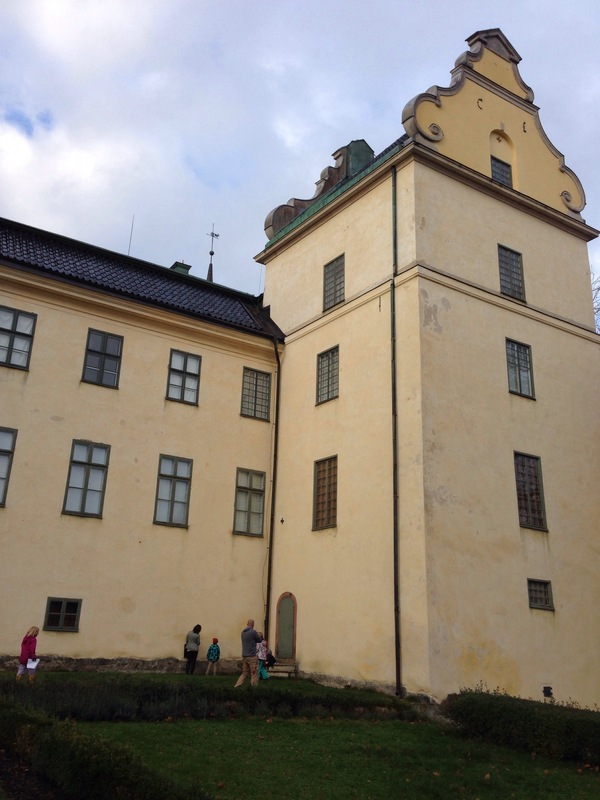 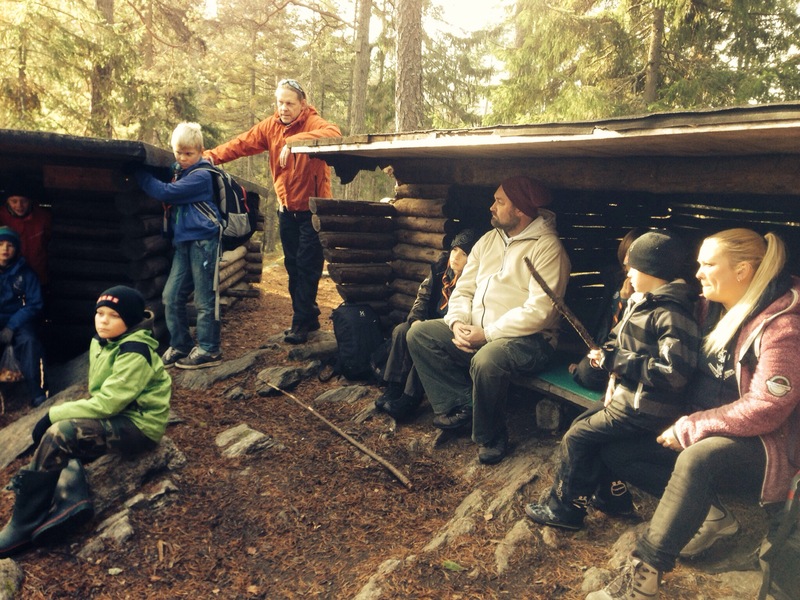 When we got to our destination, the ‘vindskydd’ (wind-protector)…. 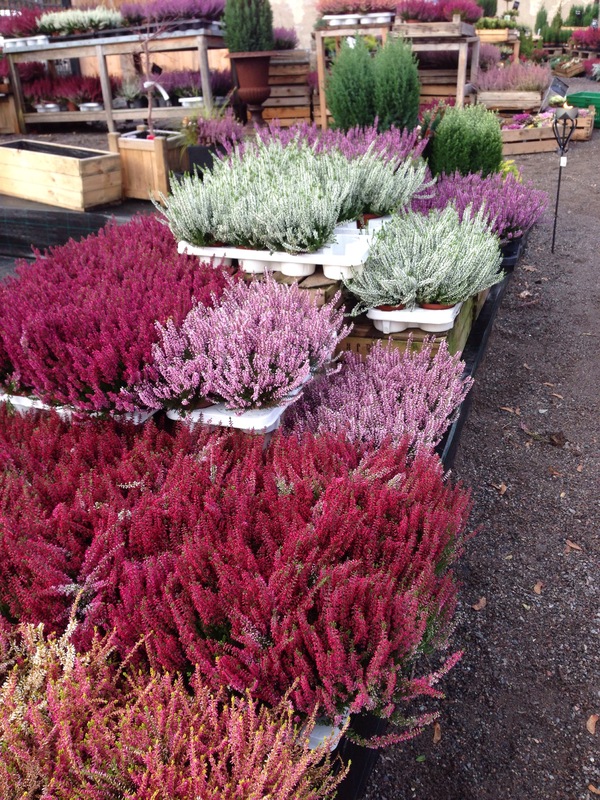 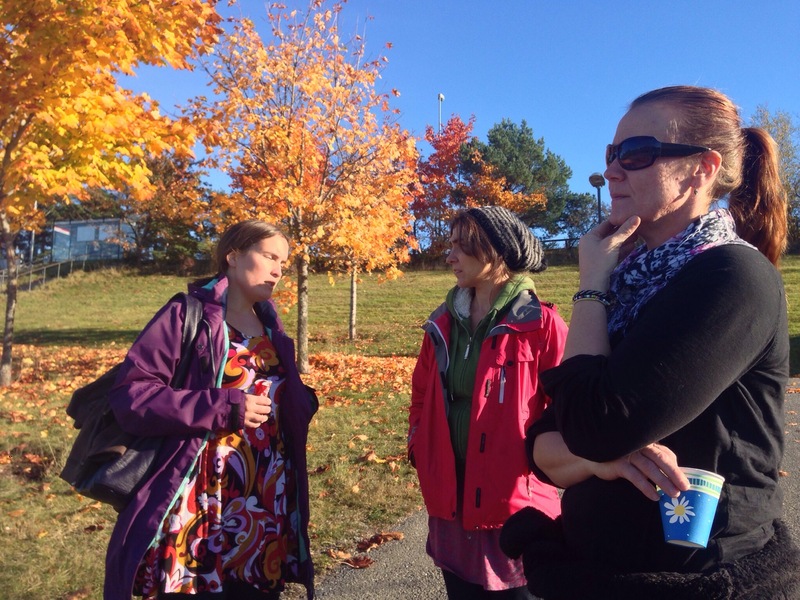 ….we first had a talk about the nature of the surrounding area…. 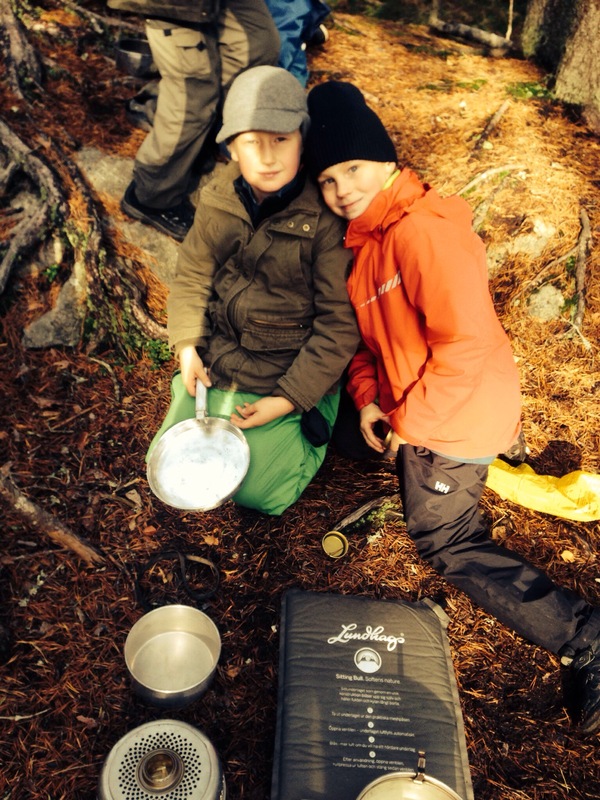 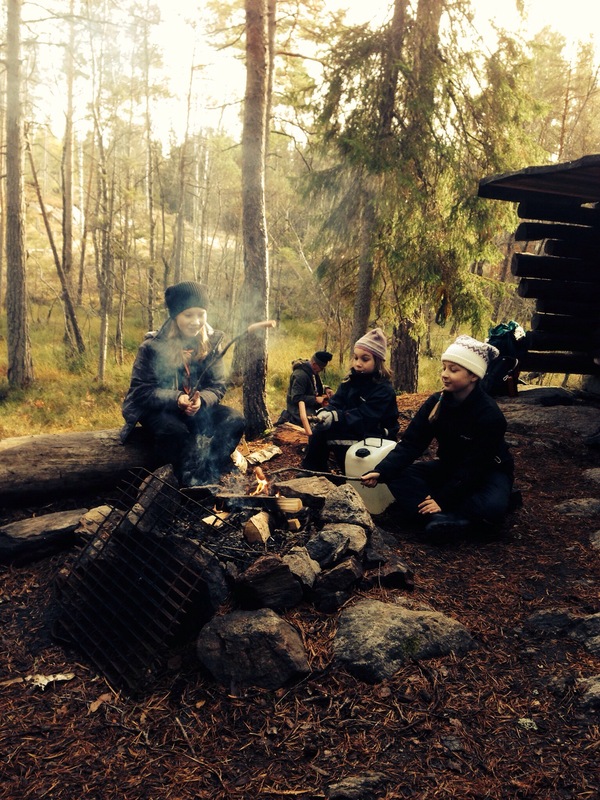 …before testing out our newly learnt knowledge on how to cook using a ‘storm kök’…. 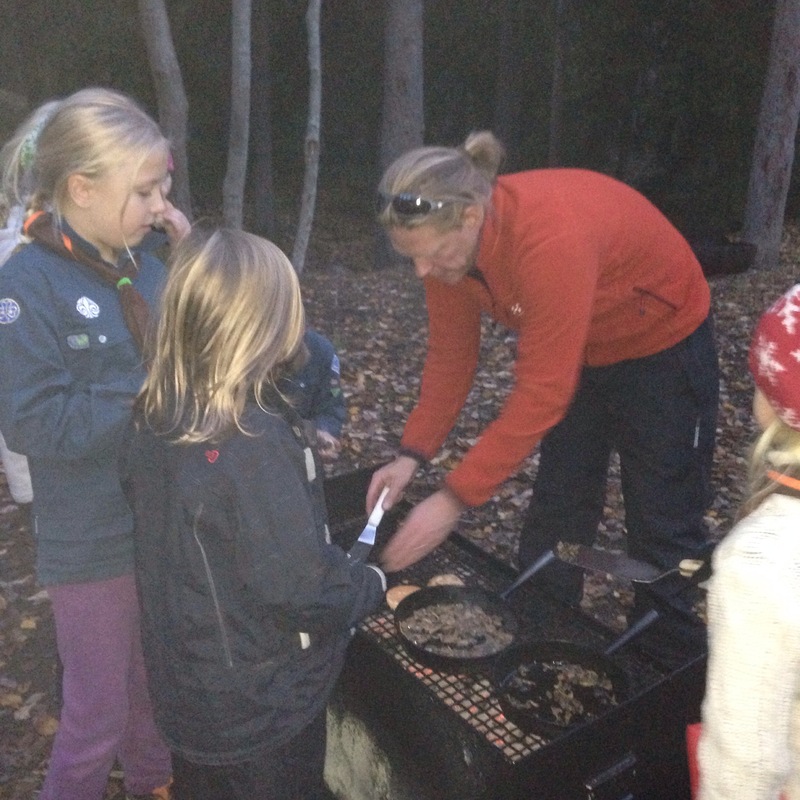 Each patrol group cooked alone, with minimal help from a scout leader – and each group managed it just fine! 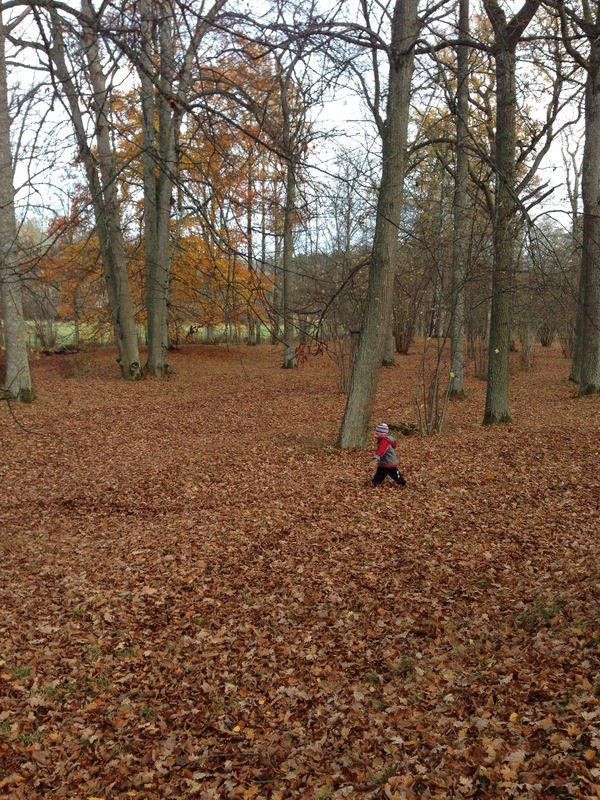 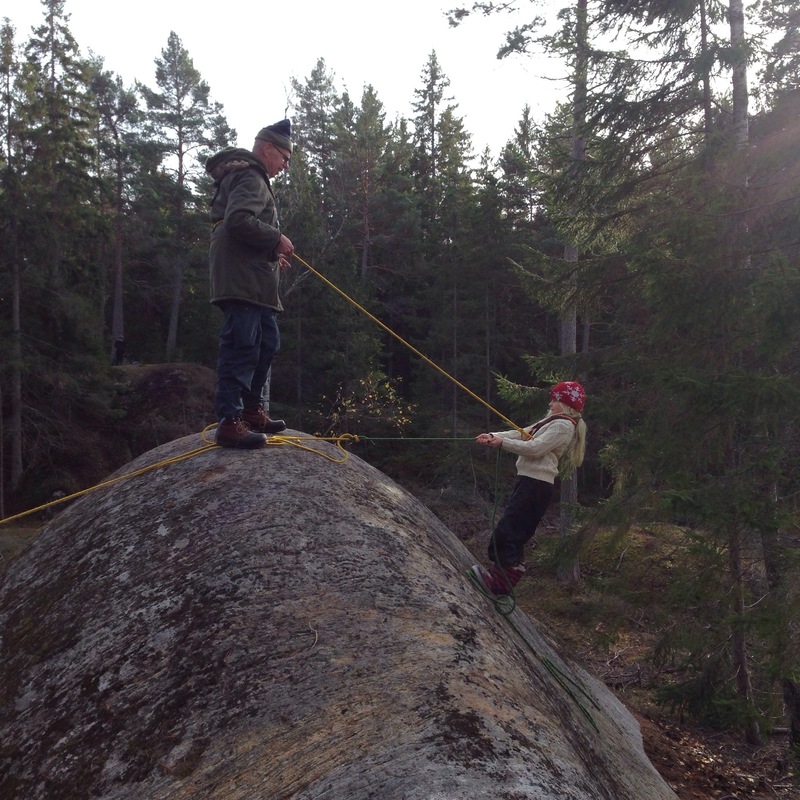 …some playing in the forest…..
…and a little rock climbing…..
…before heading back to the scout hut (having picked many more mushrooms on the way)…. 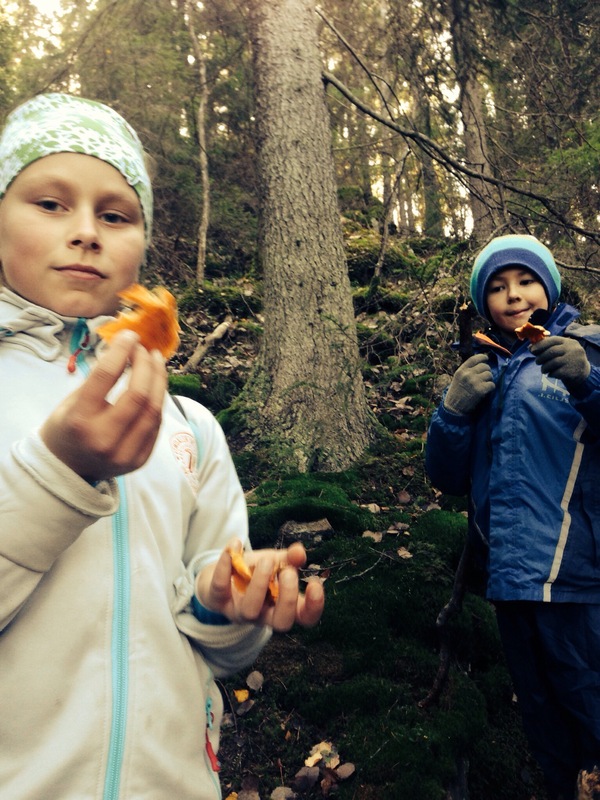 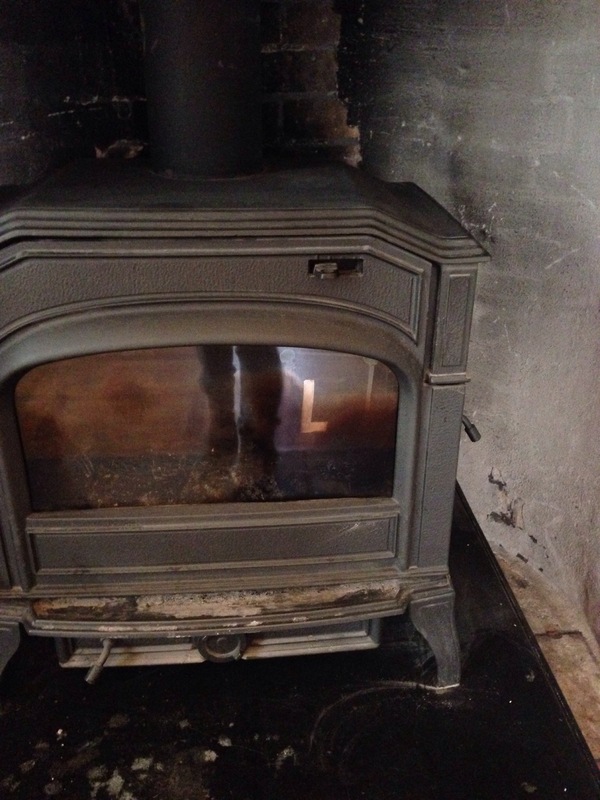 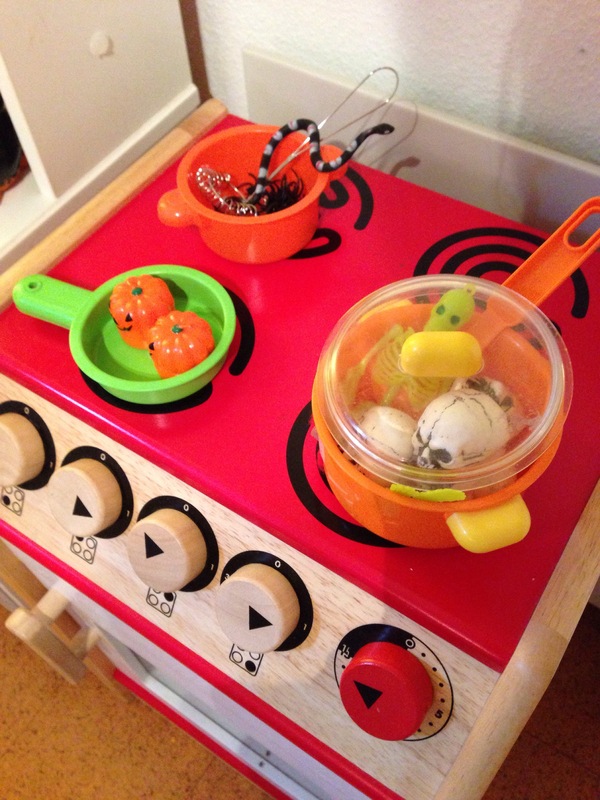 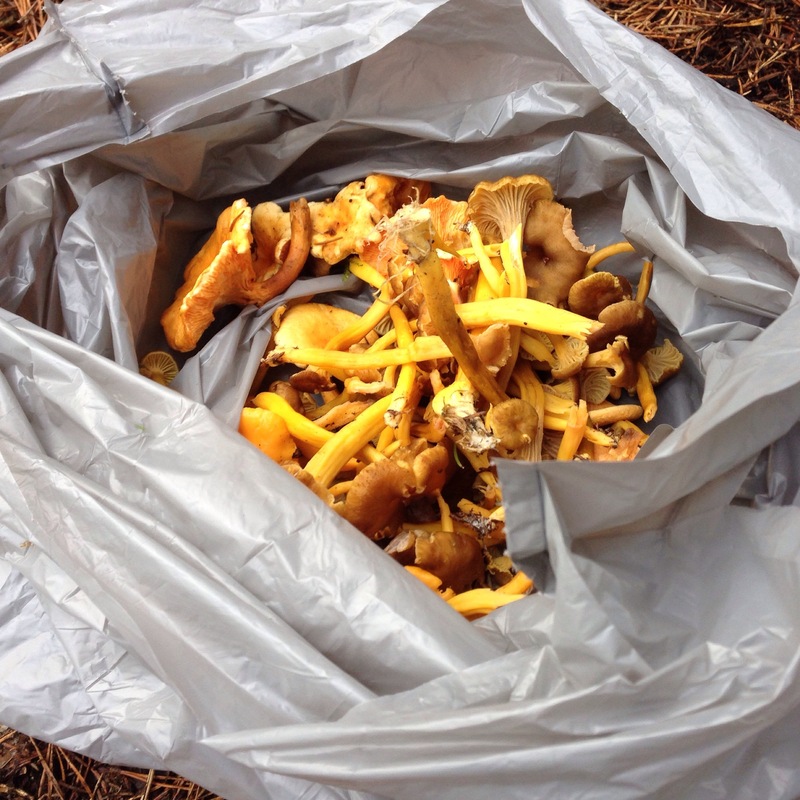 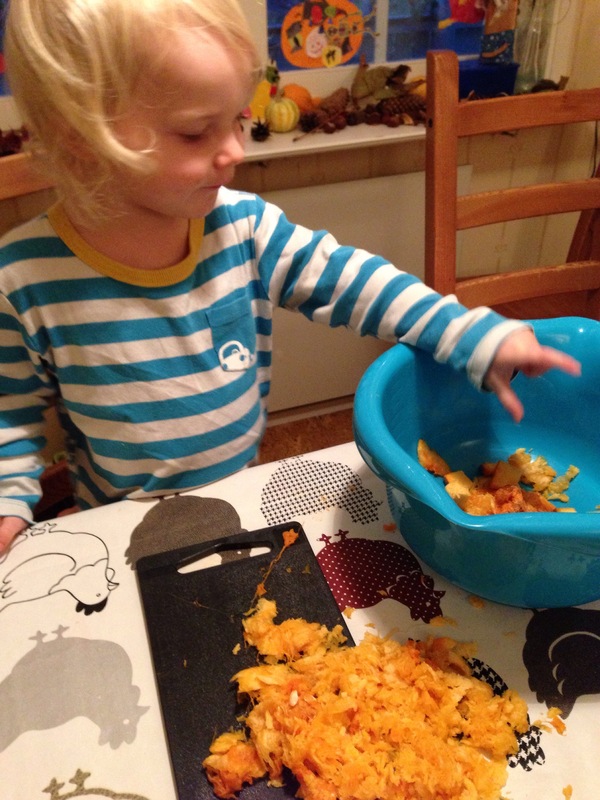 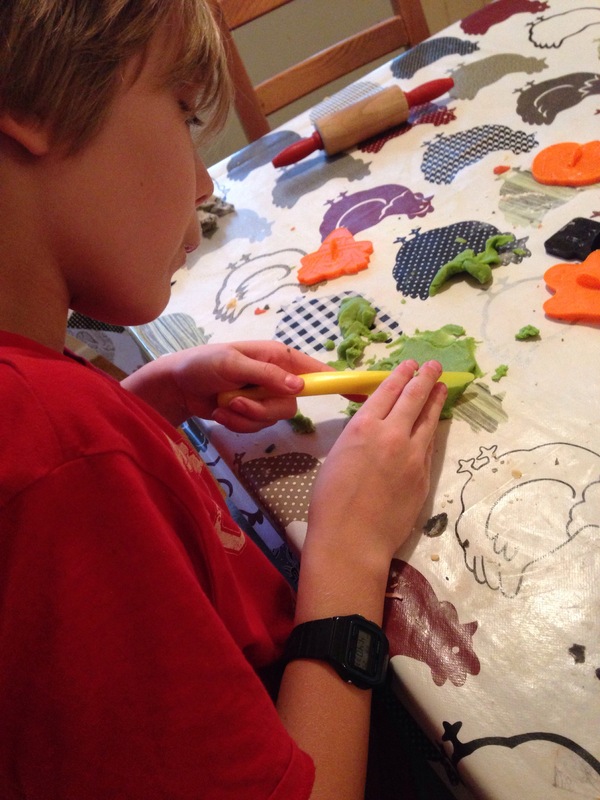 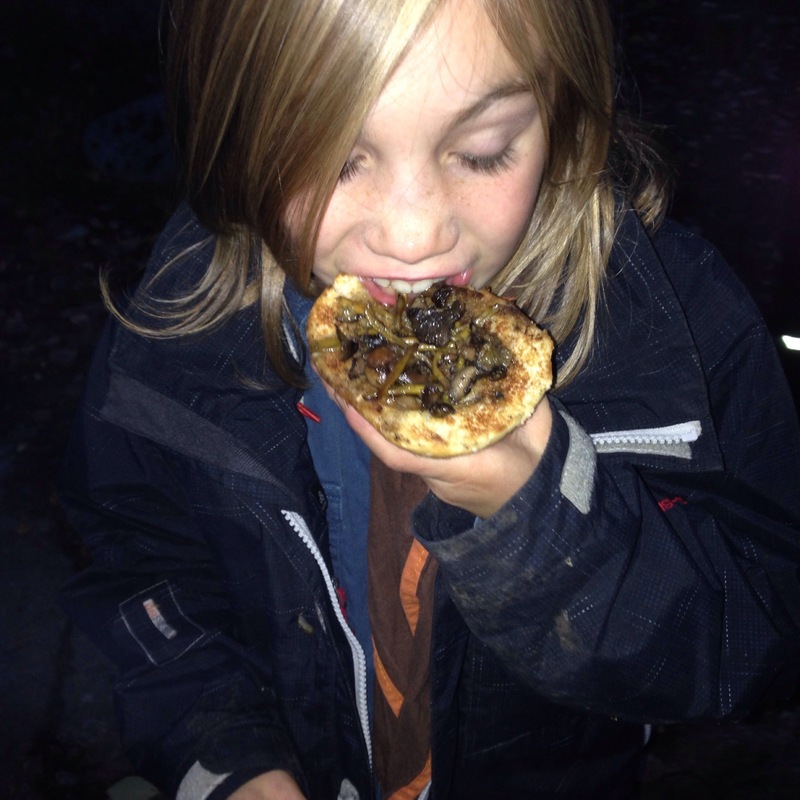 In the evening we enjoyed some games, and the cooking – and eating – of our delicious finds…. 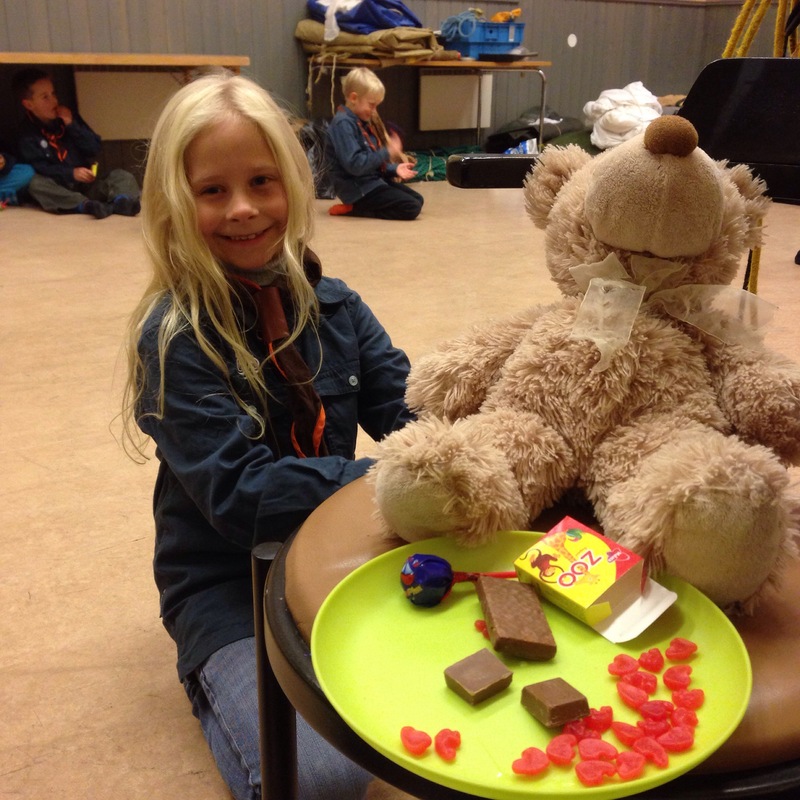 Plus no Saturday could be without a handful of sweeties (which bears and dolls were not excluded from)…. 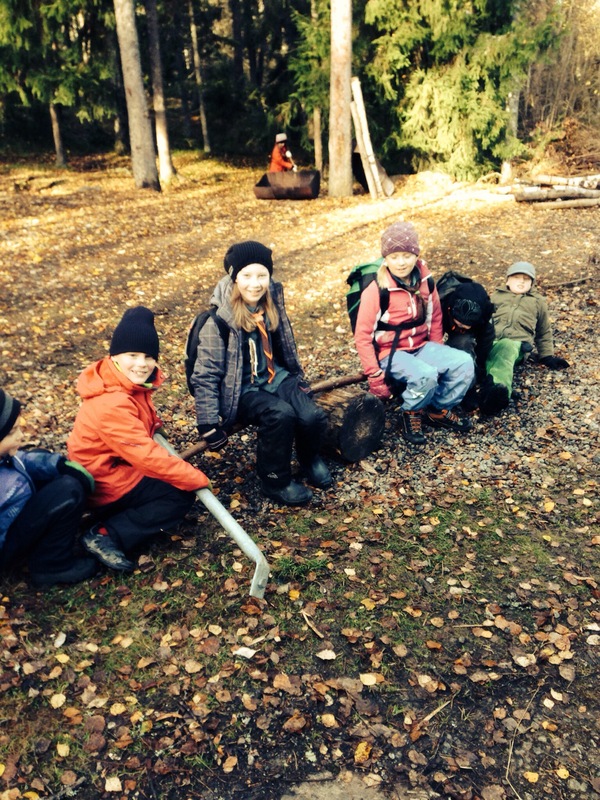 …before settling in to our sleeping bags for a long nights sleep in the scout hut! 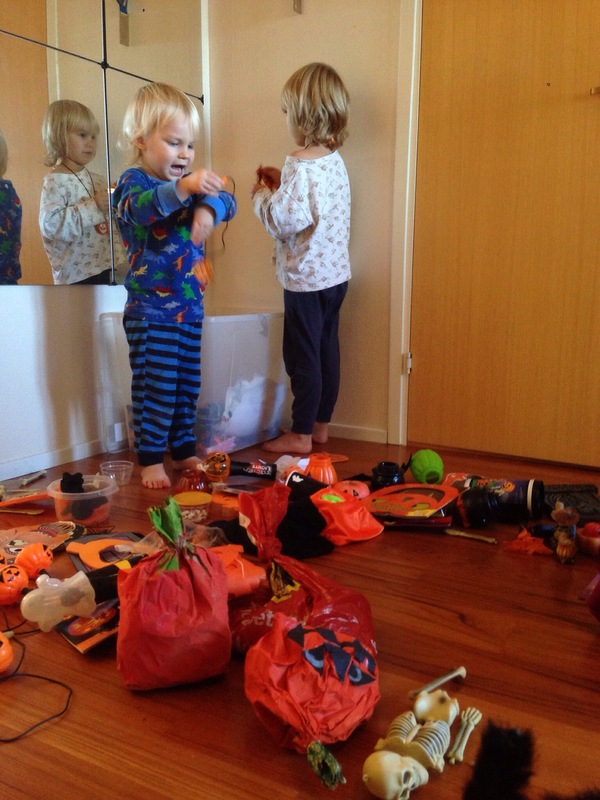 It’s always exciting taking out “the Halloween box” – all my kids are crazy about Halloween – even Teddy, who doesn’t really know what it is…. 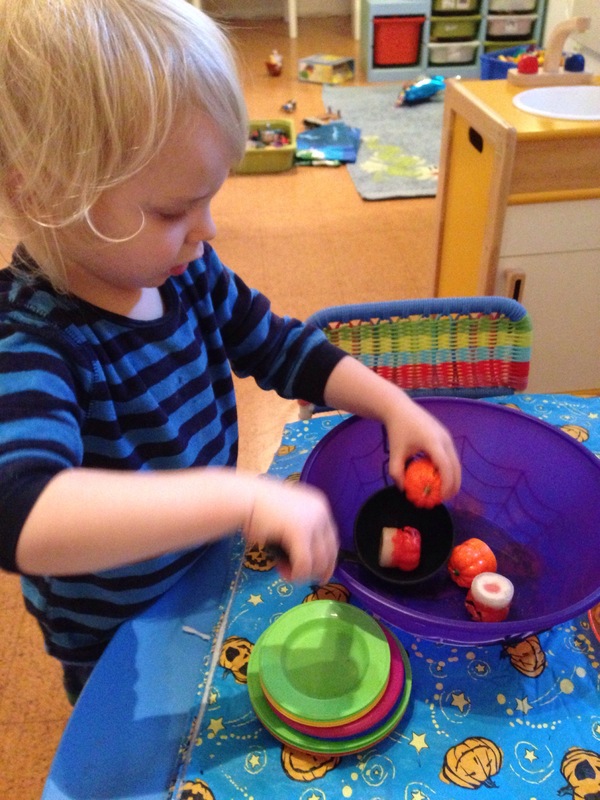 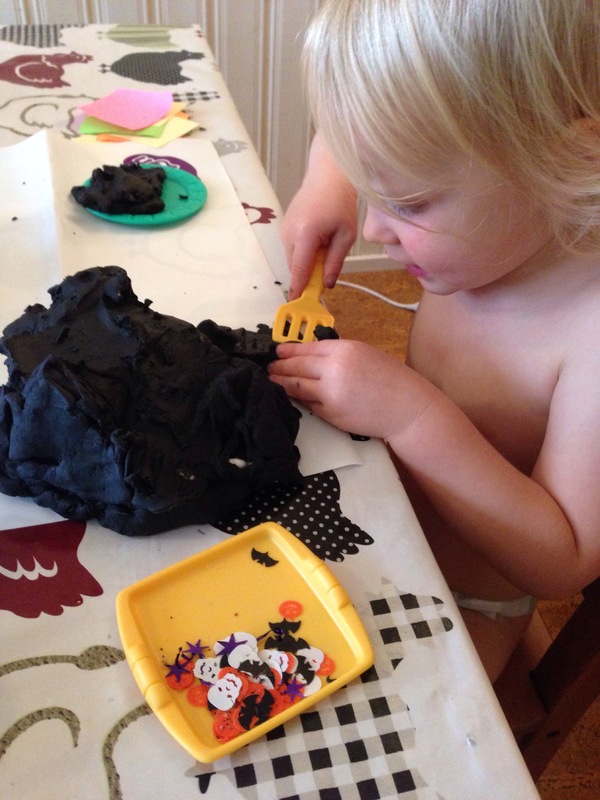 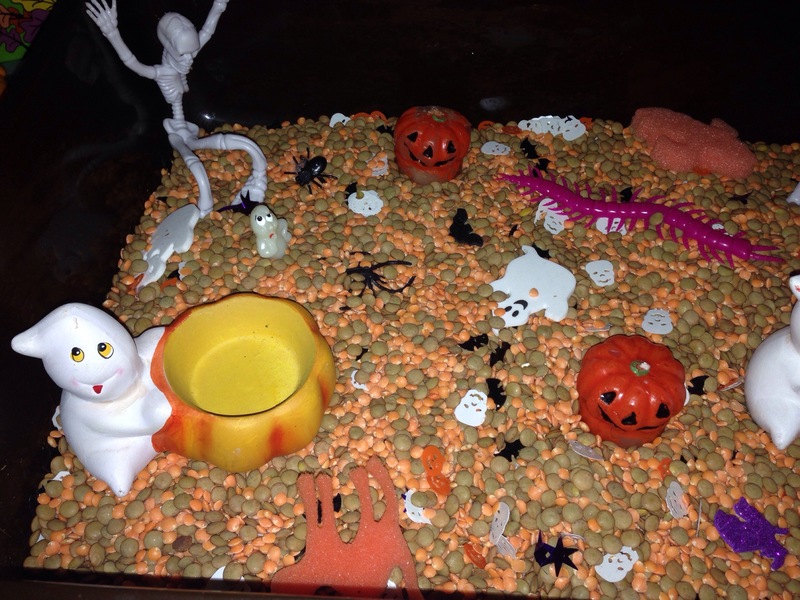 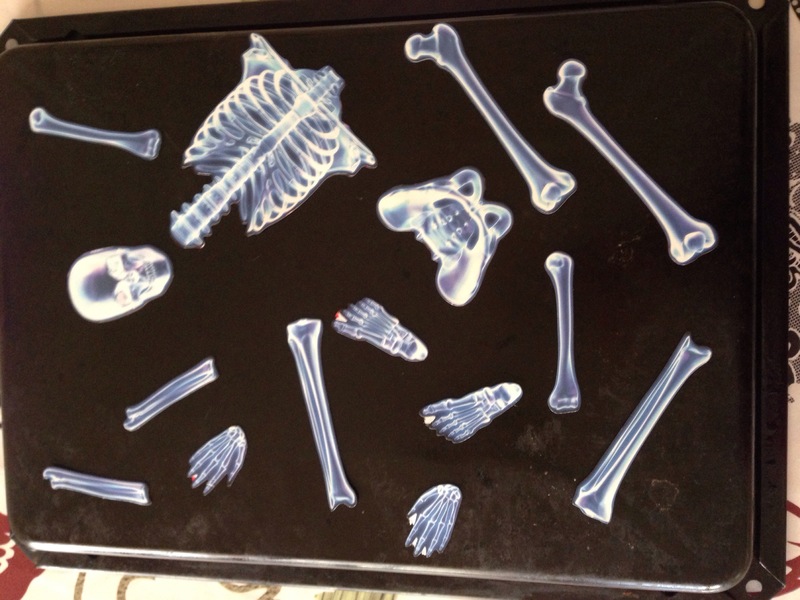 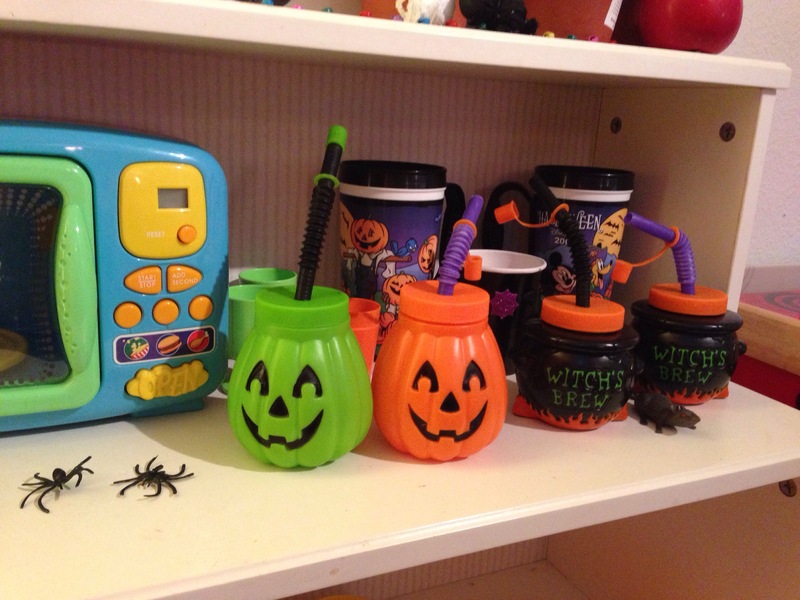 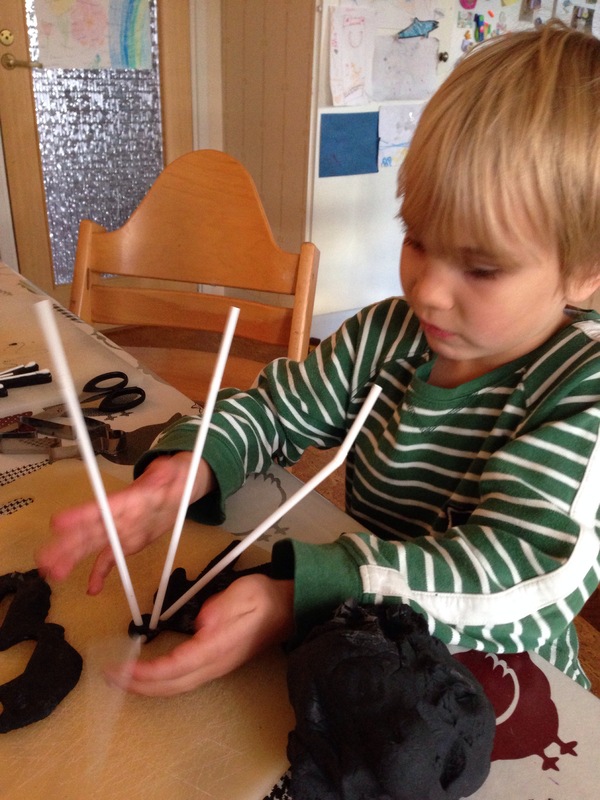 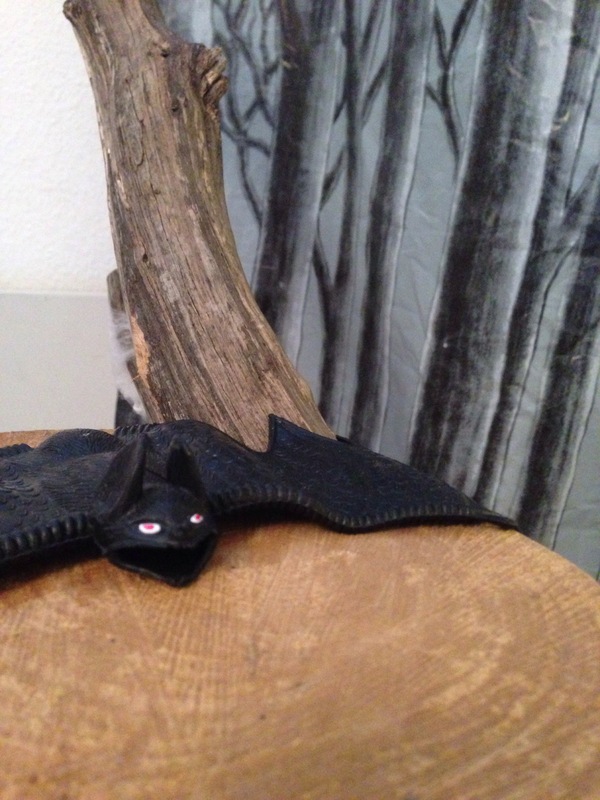 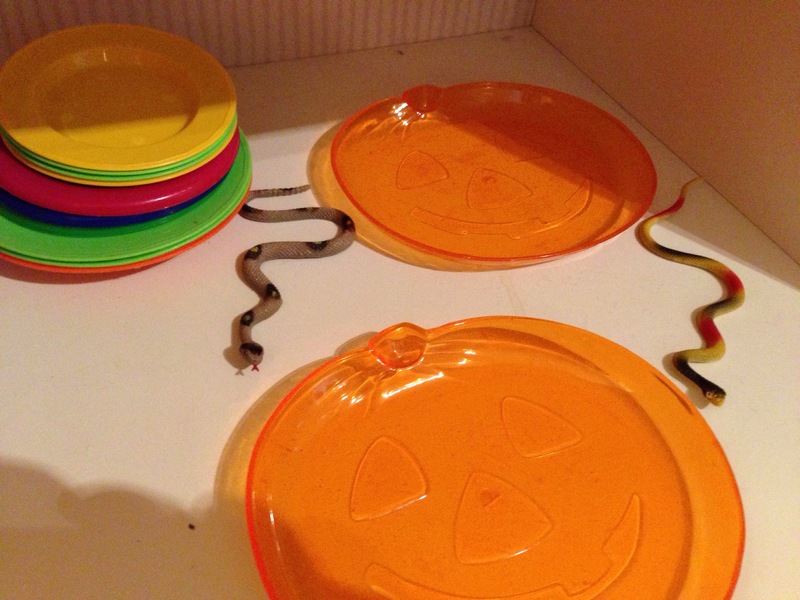 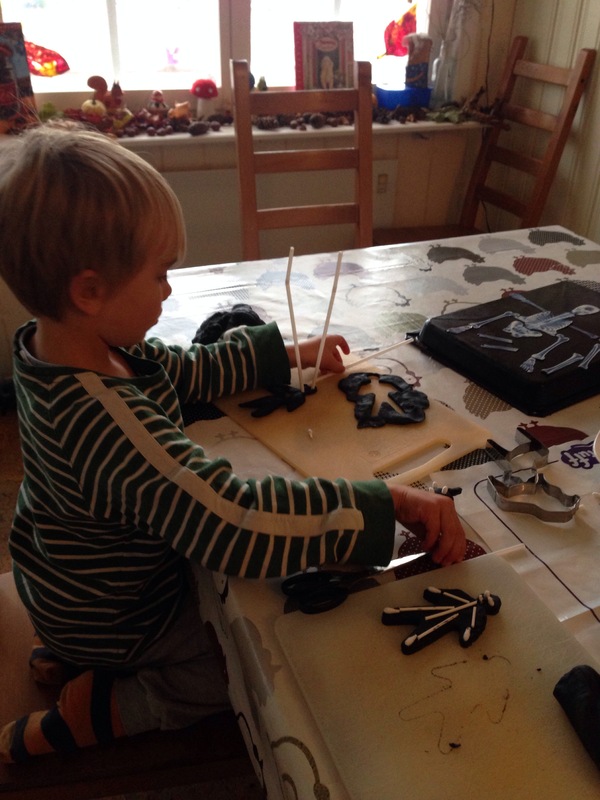 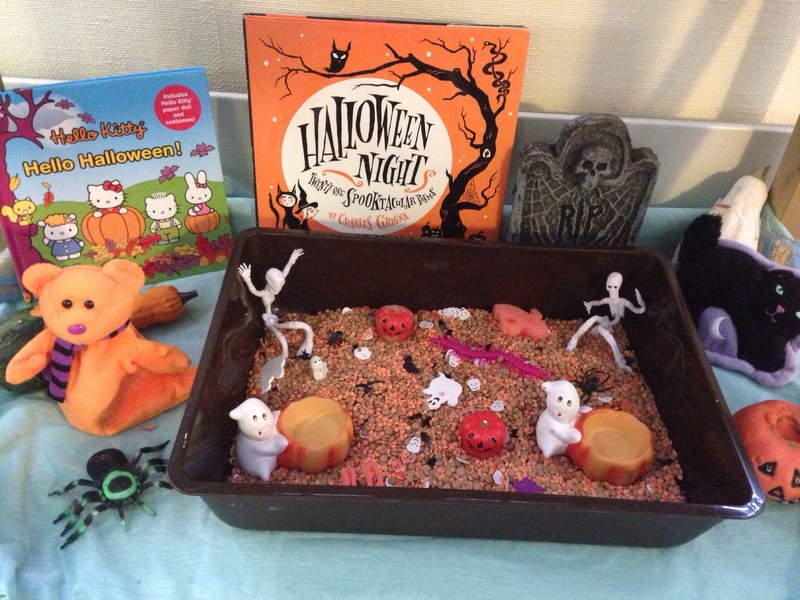 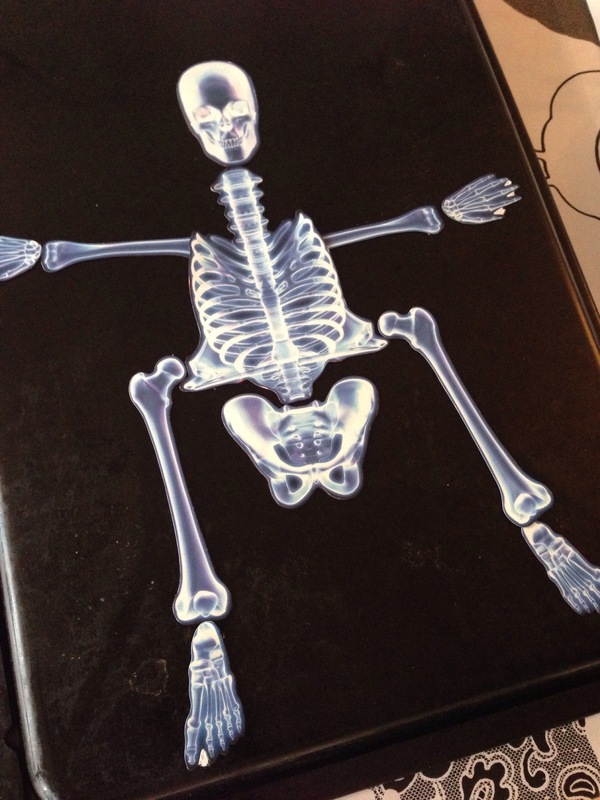 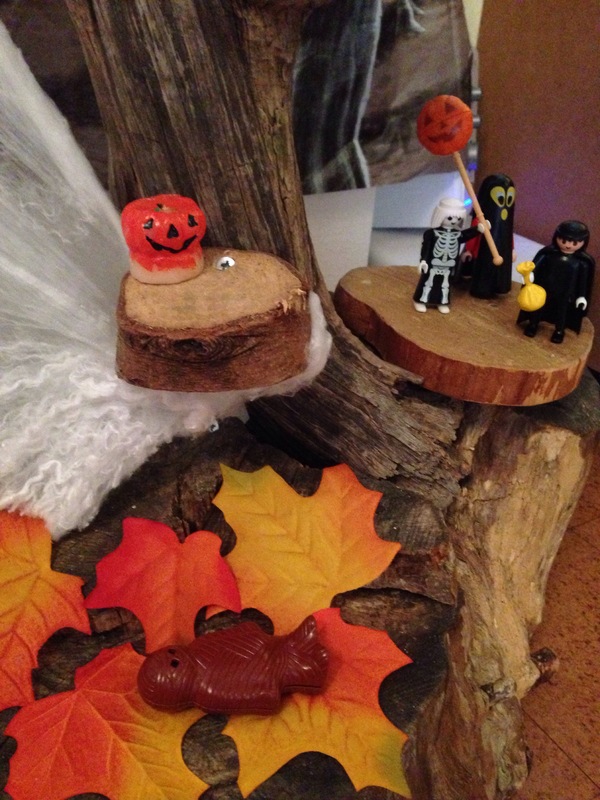 So it seemed only too fair to set up a Halloween sensory box for him…. 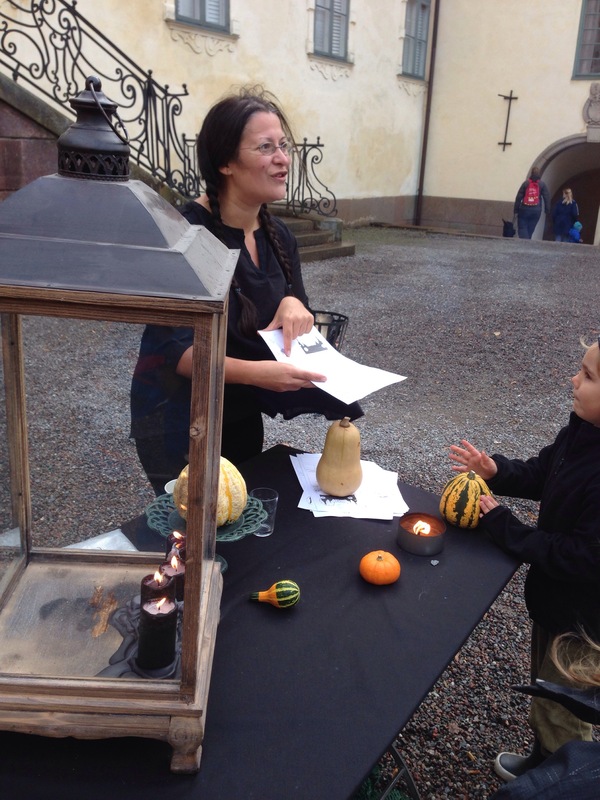 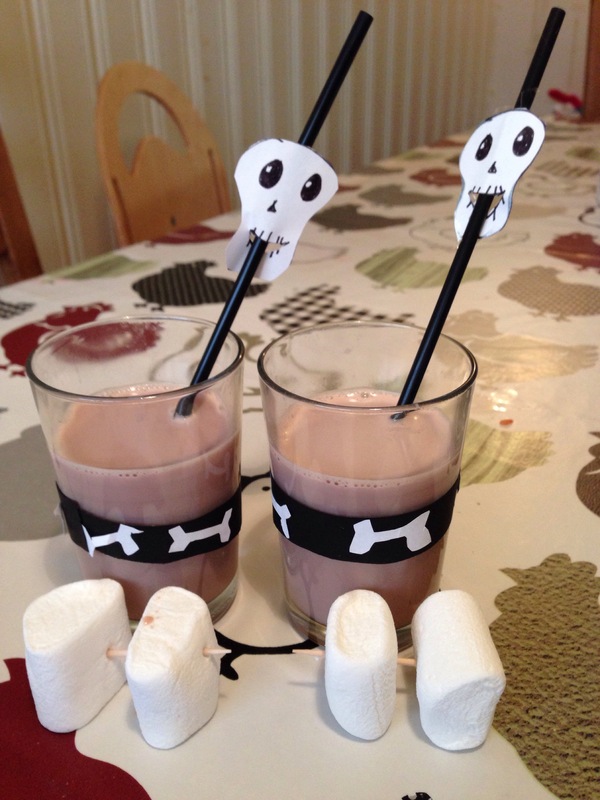 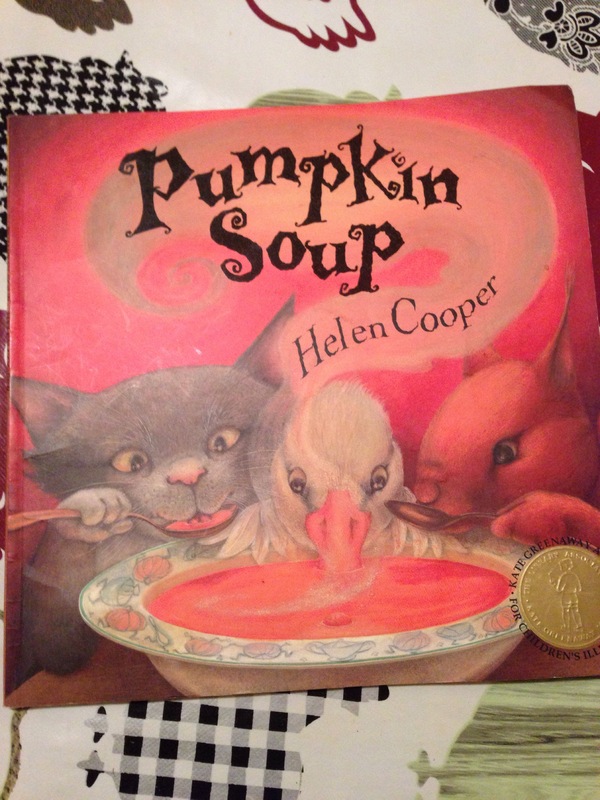 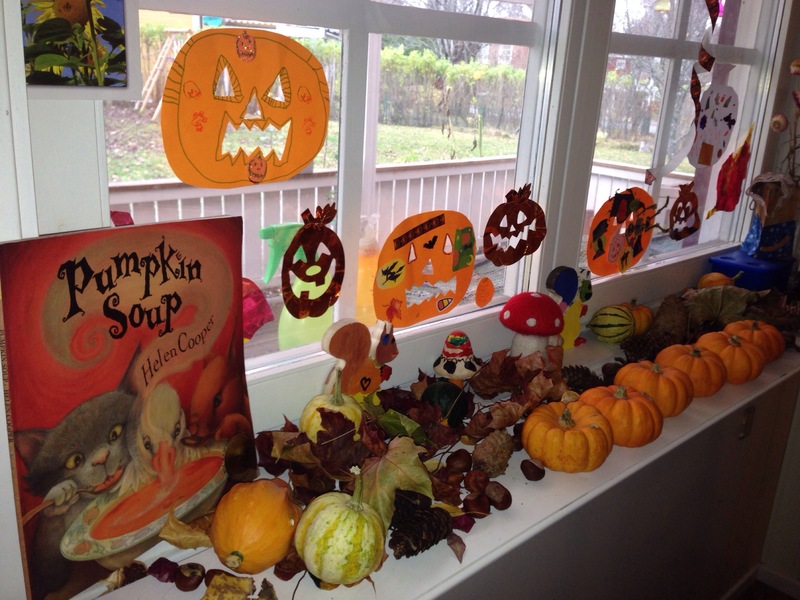 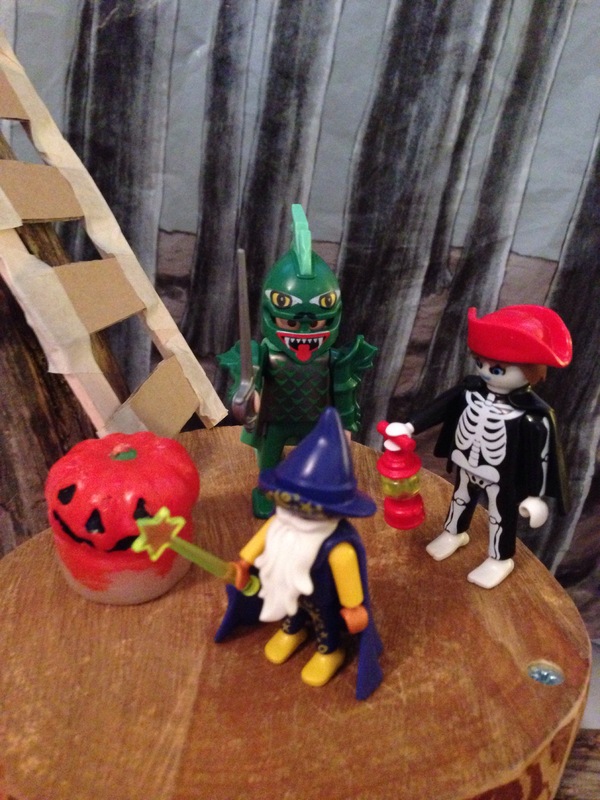 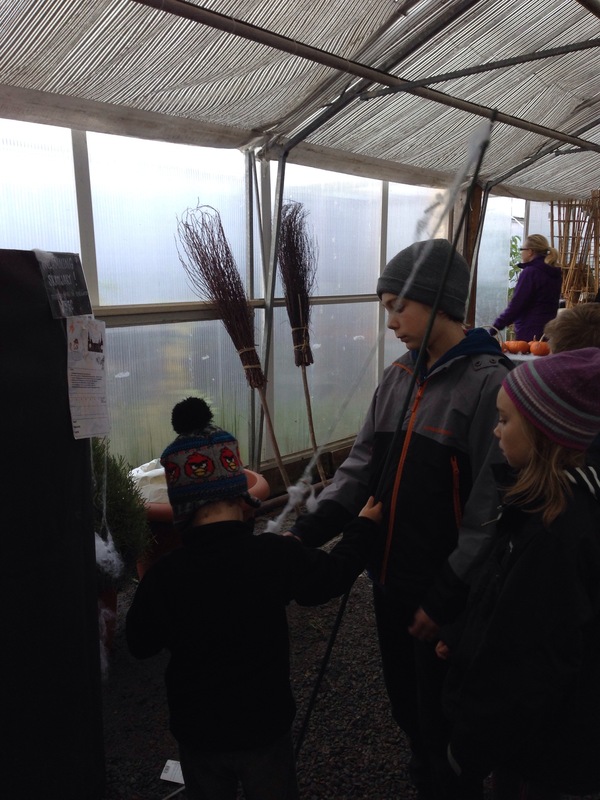 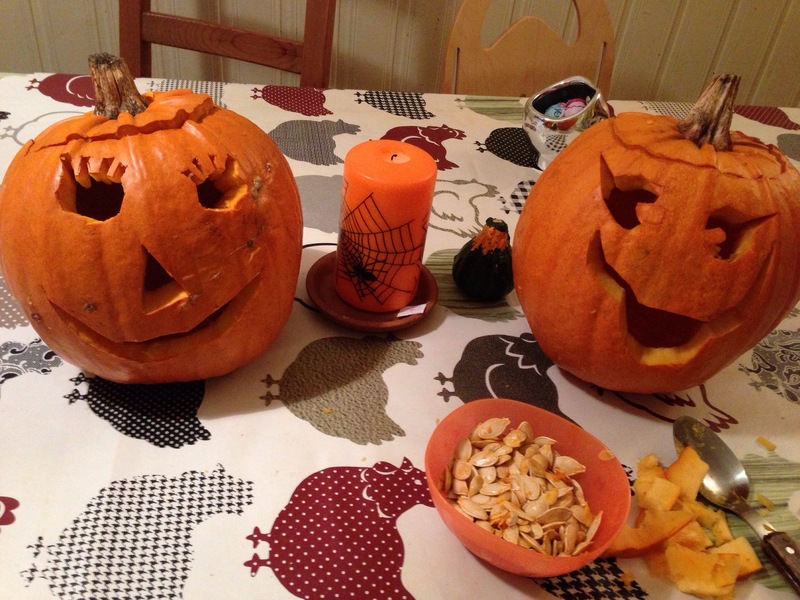 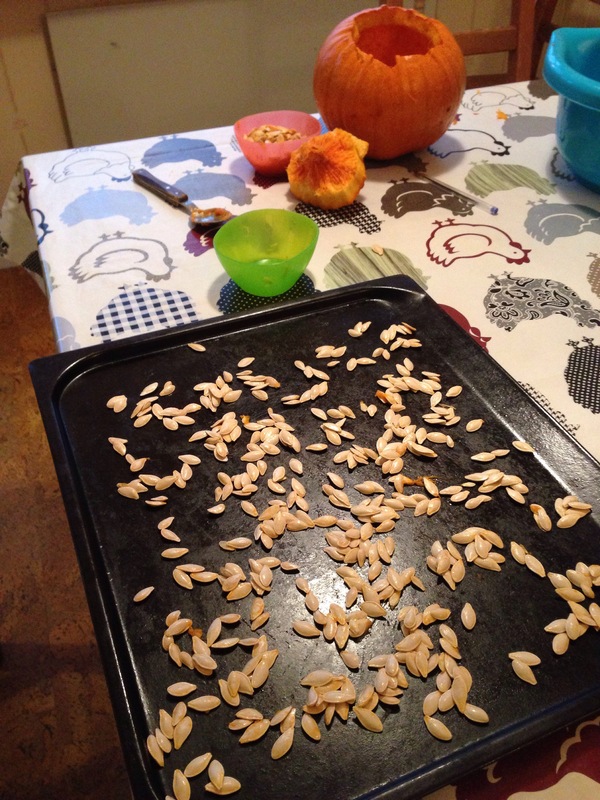 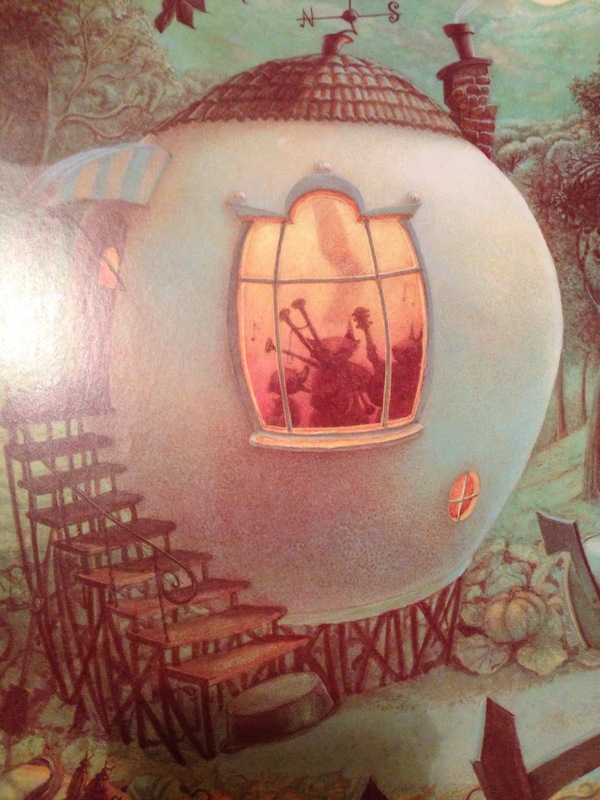 …though feeding the skeletons and pumpkins with the lentils (“cookies”) was the way to go…. 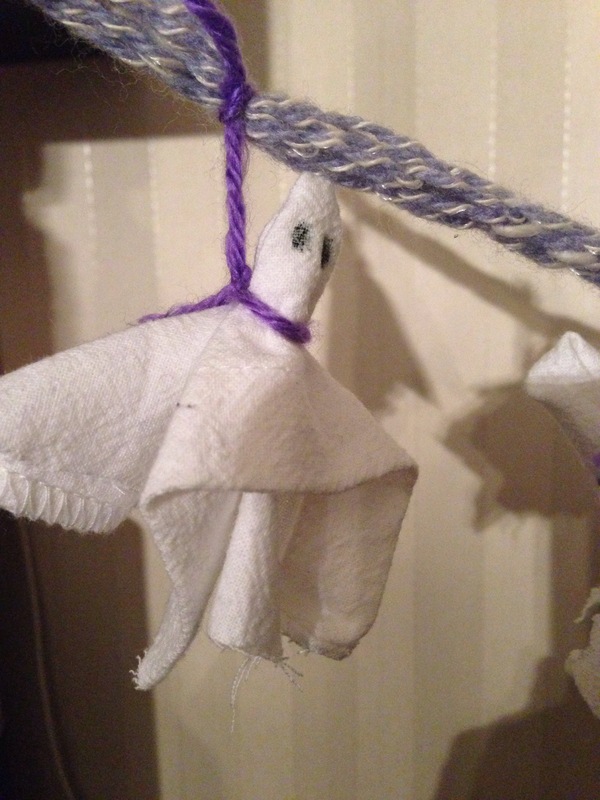 Lately we’re all about ghosts. 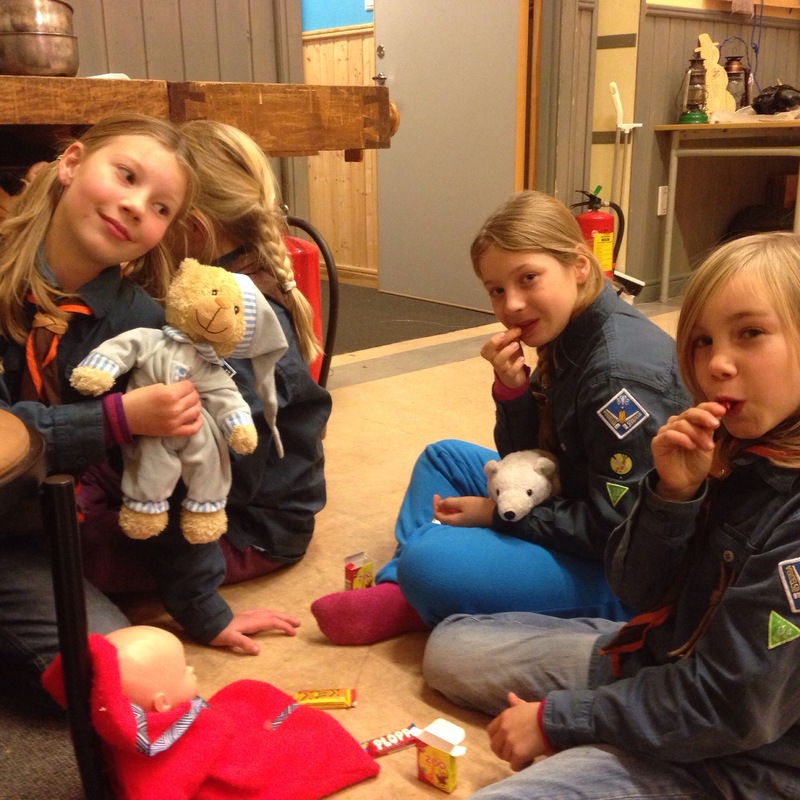 Rather sweet ones it seems. 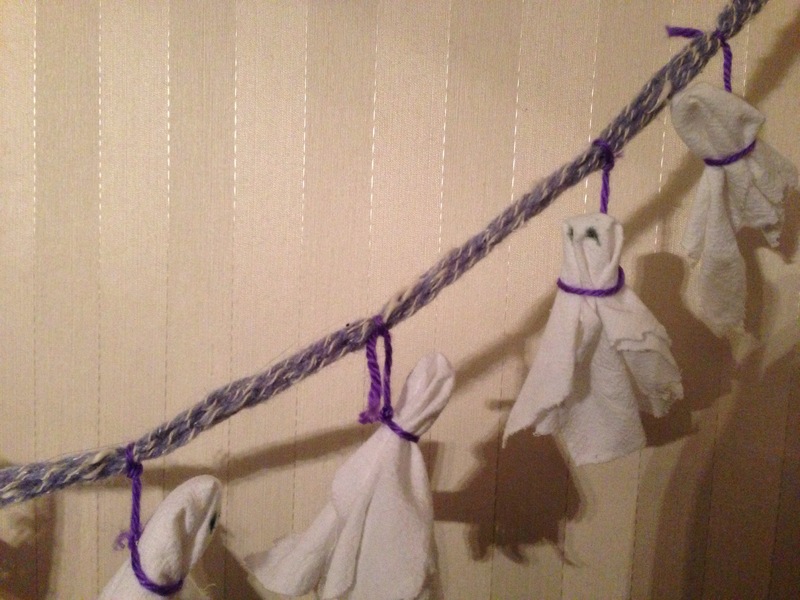 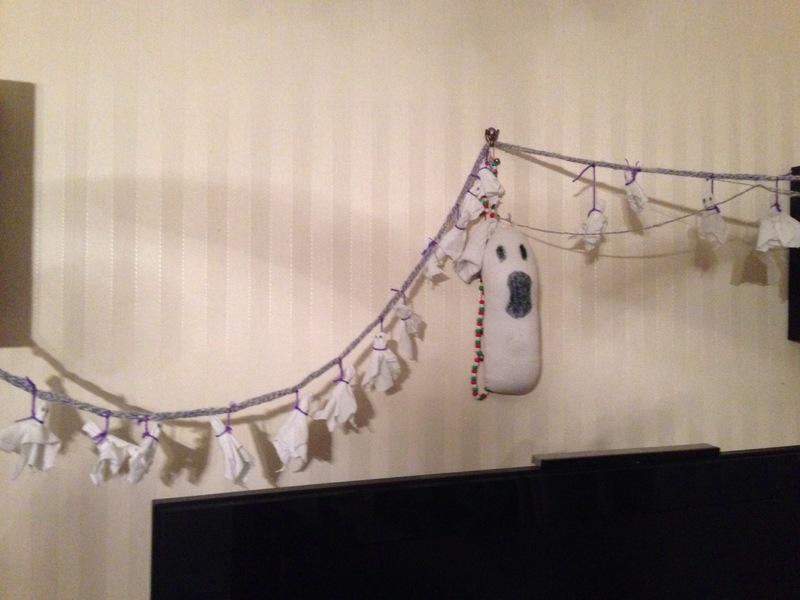 Maya, who’s presently fond of any type of handicraft, decided to finger-knit a garland for some hanging ghosts. 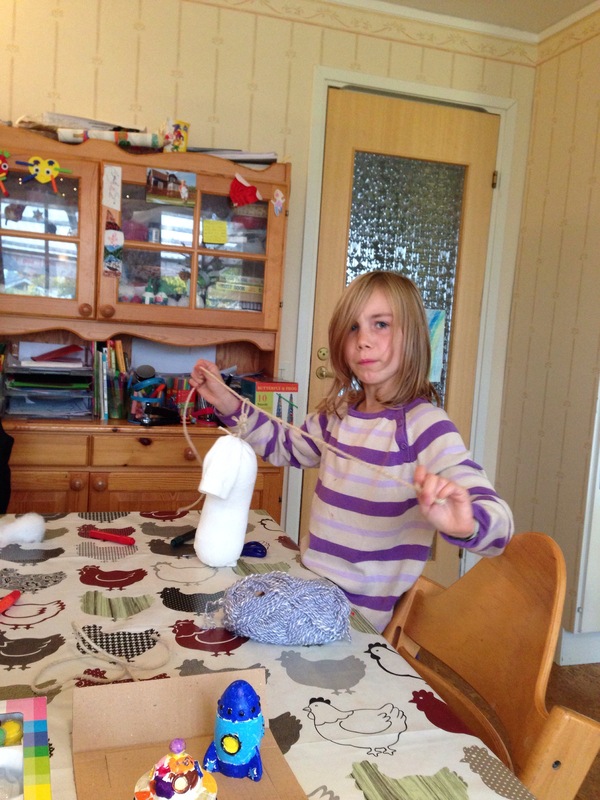 In typical Maya fashion, she came up with a something original, and something that moves…. 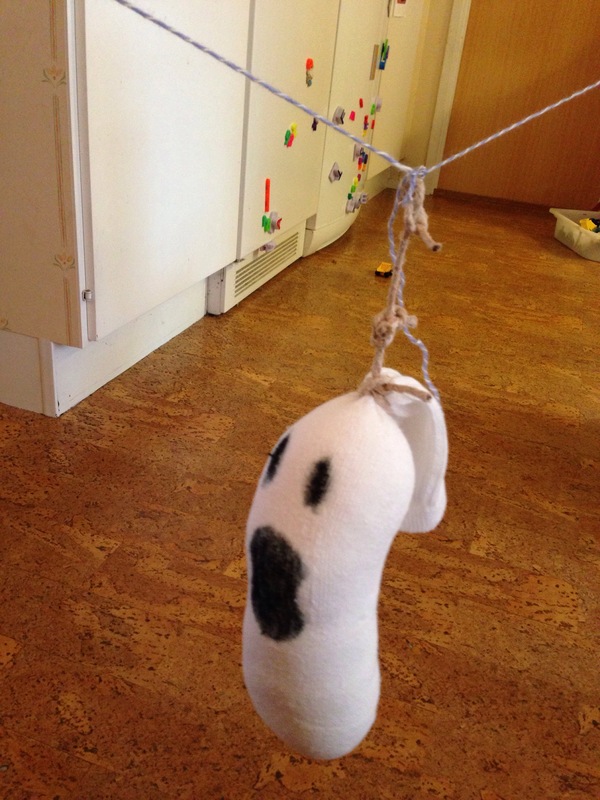 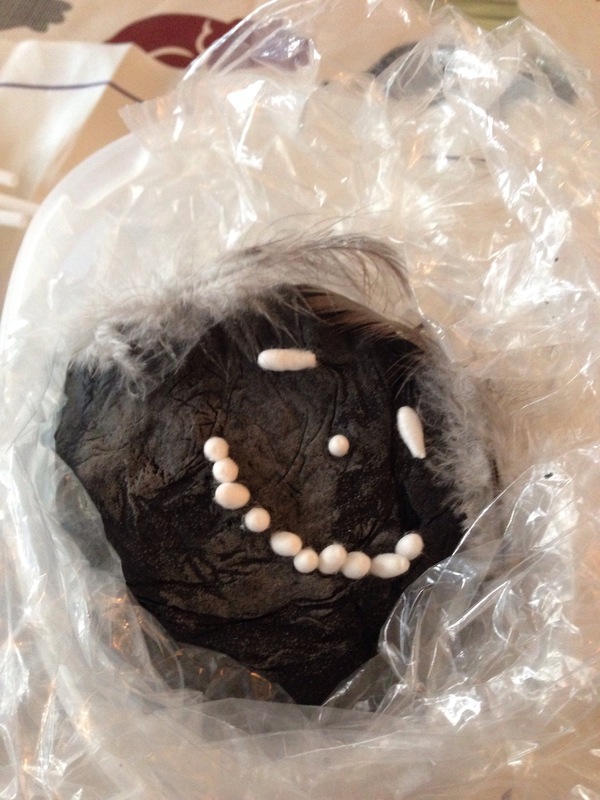 The socks were filled with pillow stuffing, tied with string, and faces drawn on. 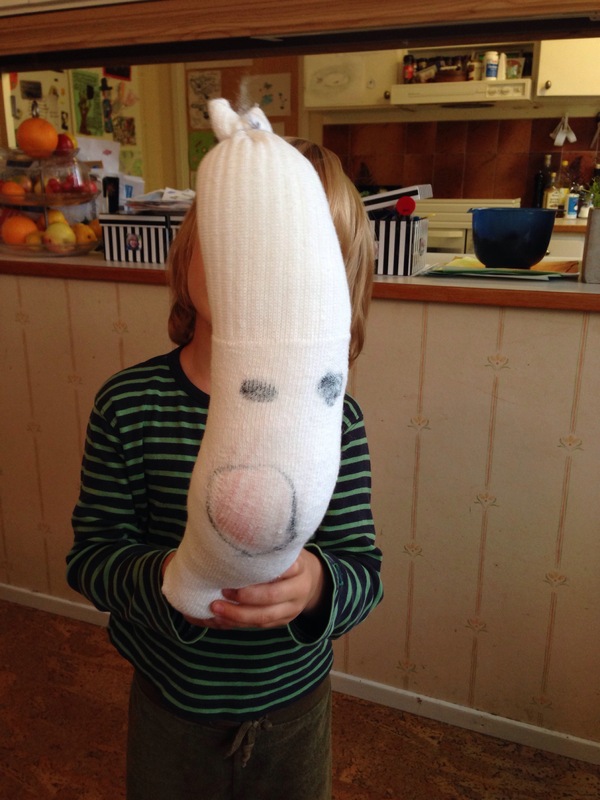 Here is Alfie modelling his – which he has since taken to bed every night – however, unbeknown to me, Maya had other ideas…. 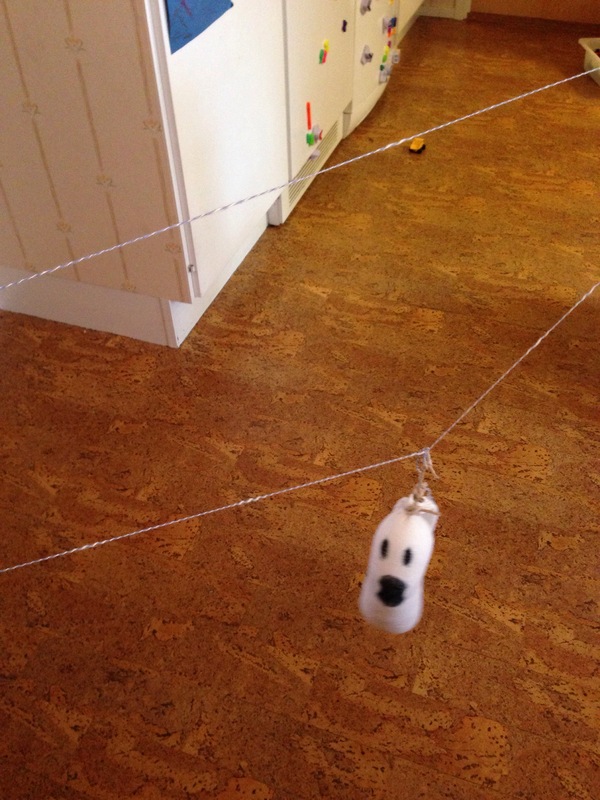 ….a ghost on a zip line……. 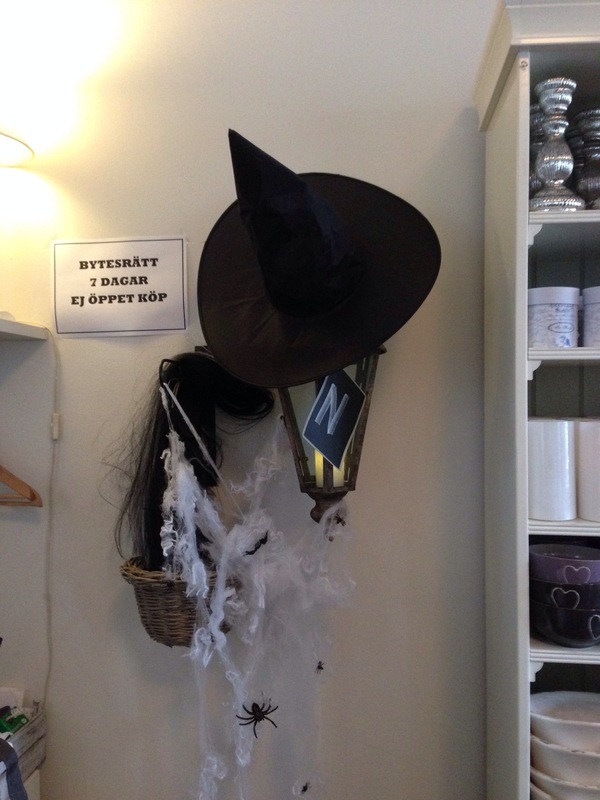 And yes, they really fly….! 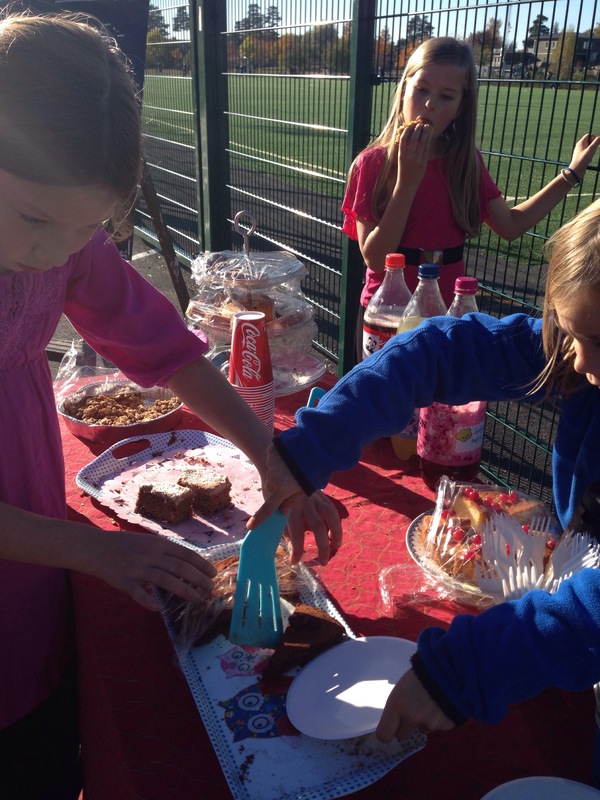 A couple of weeks a go Maya and her friend Filippa starting a baking session. 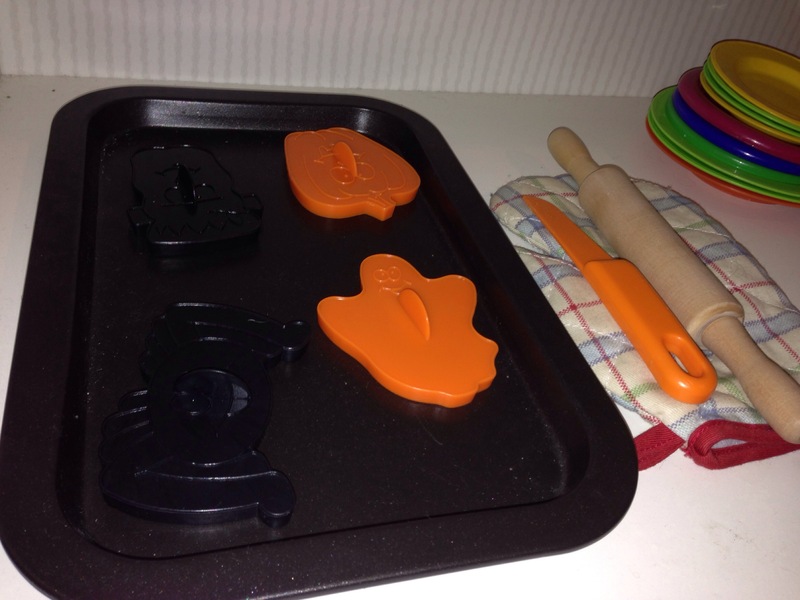 Apple pie, chocolate cake, chocolate shortbread, coconut cake, chocolate balls, sponge cake, etc, have been baked on and off for the past two weeks, and put in the freezer, until yesterday. 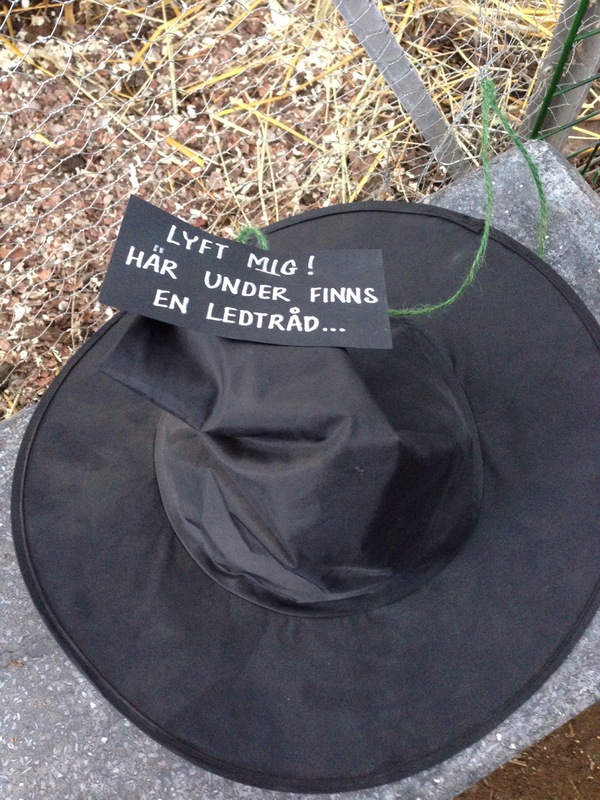 Signs have been written, laminated and put up around the local area.. 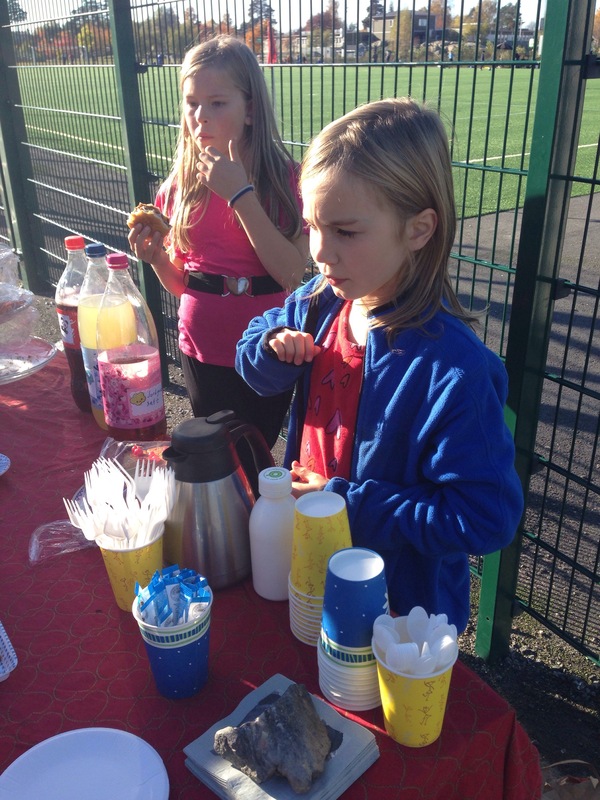 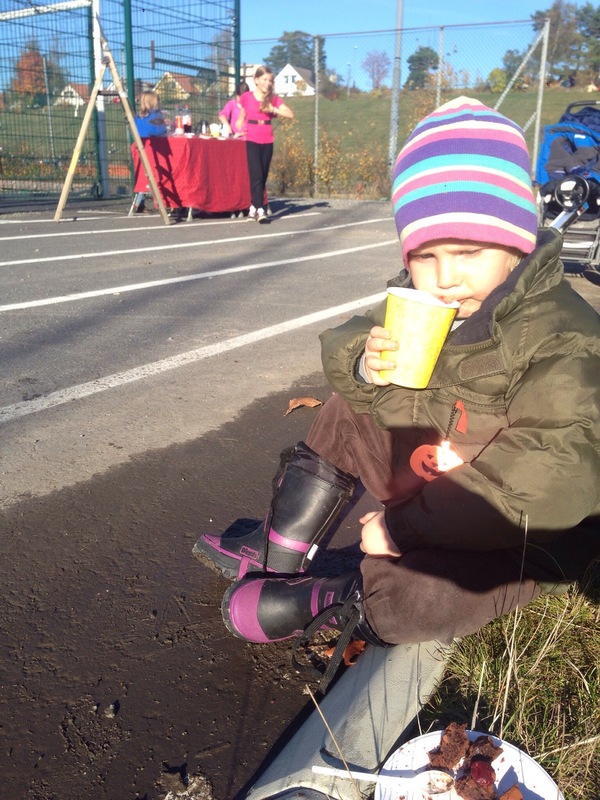 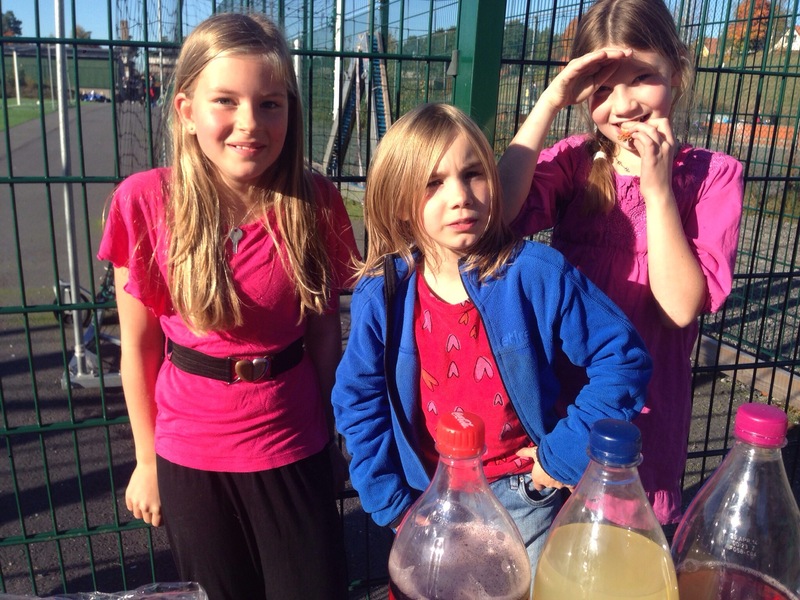 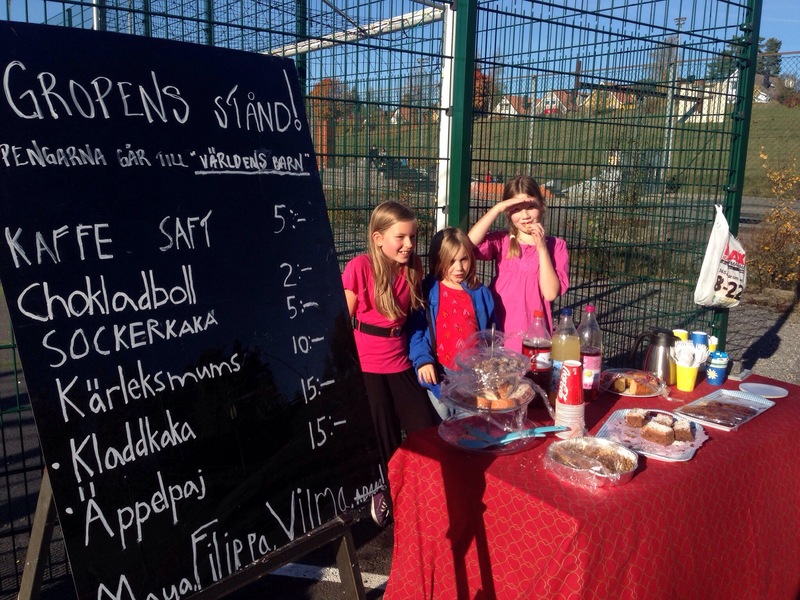 Yesterday, Maya, Filippa and Wilma set up their stall outside the football pitch where a match was about to start. 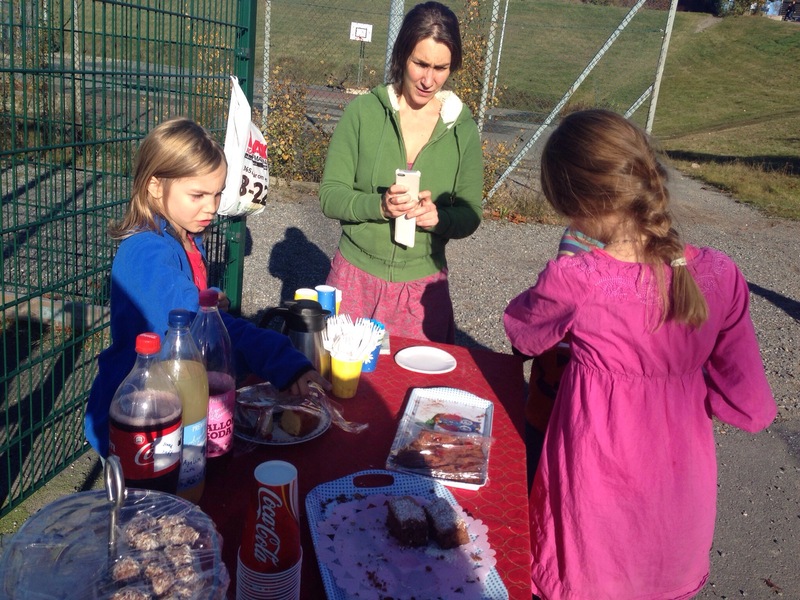 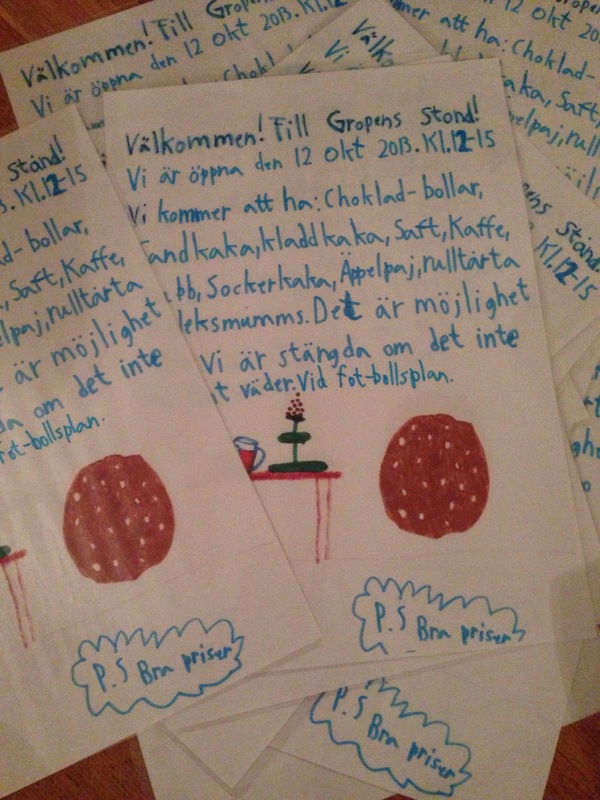 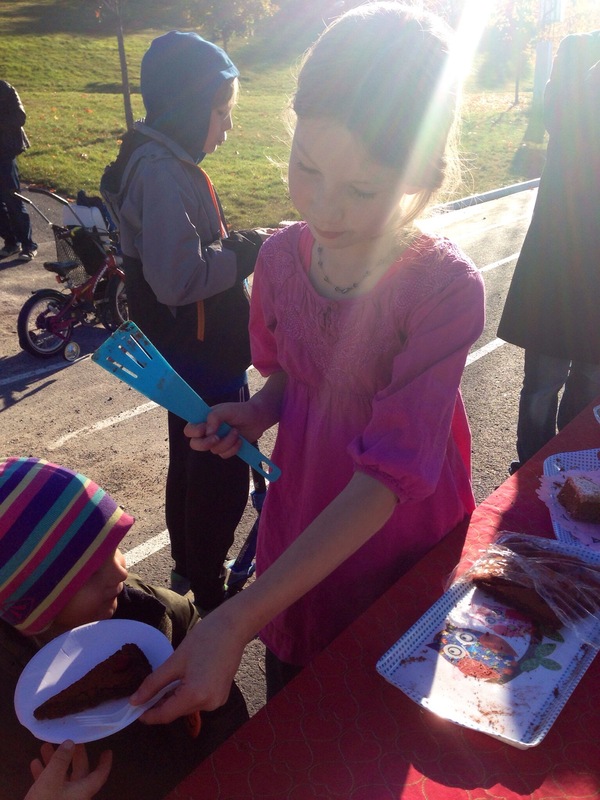 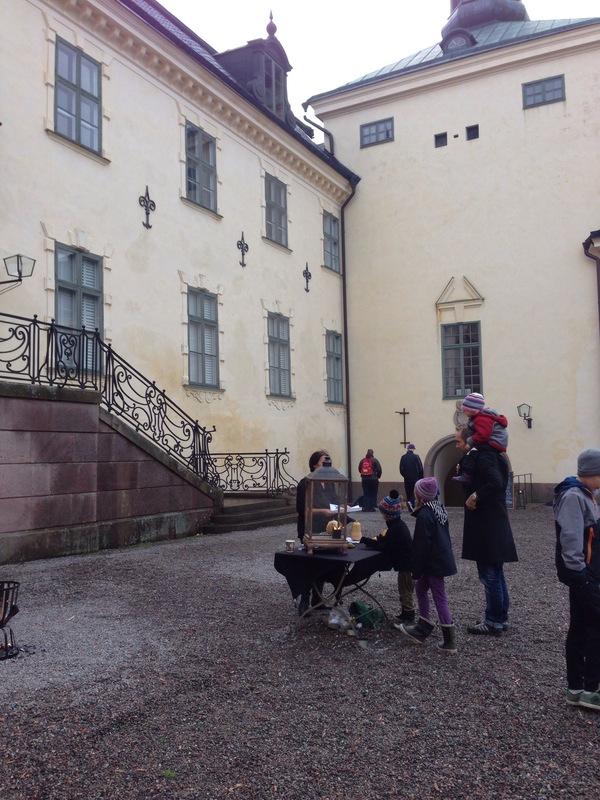 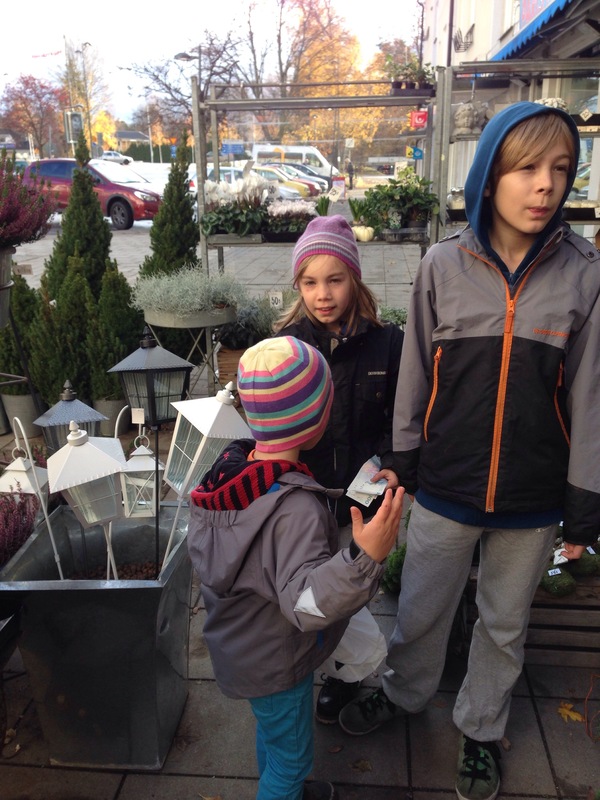 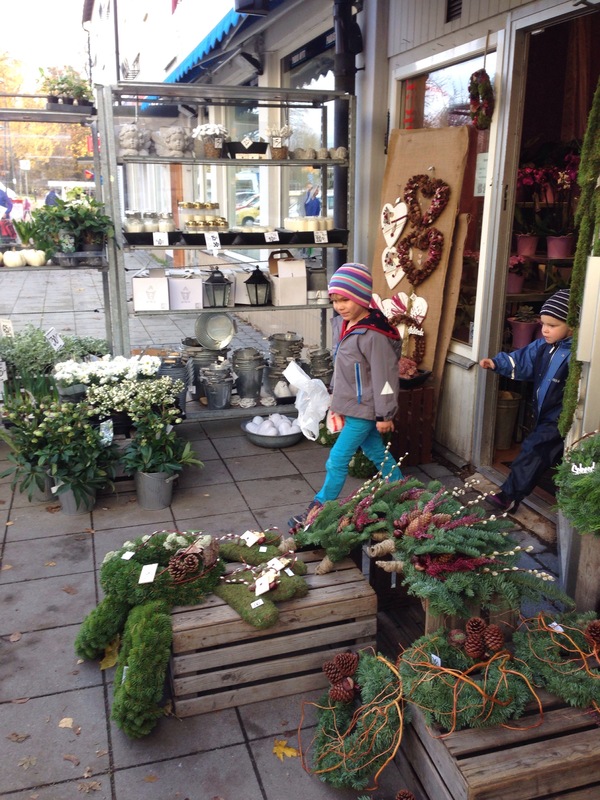 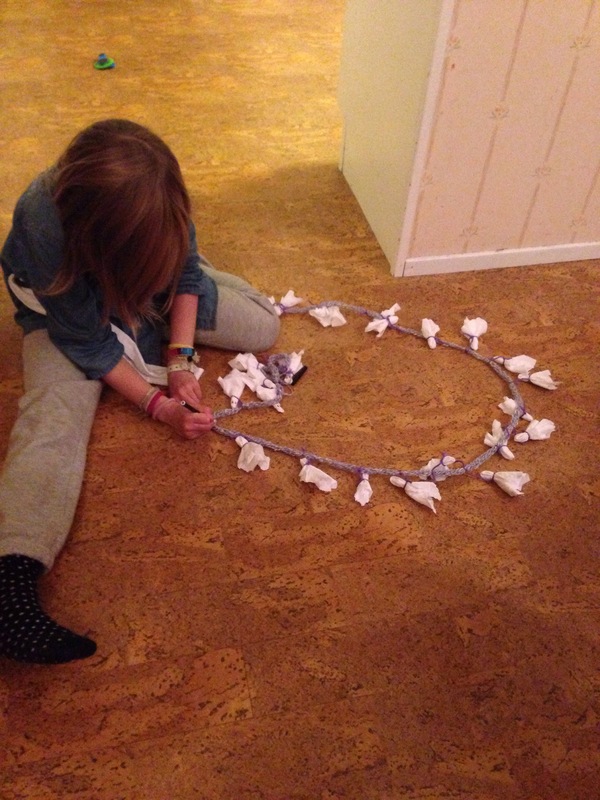 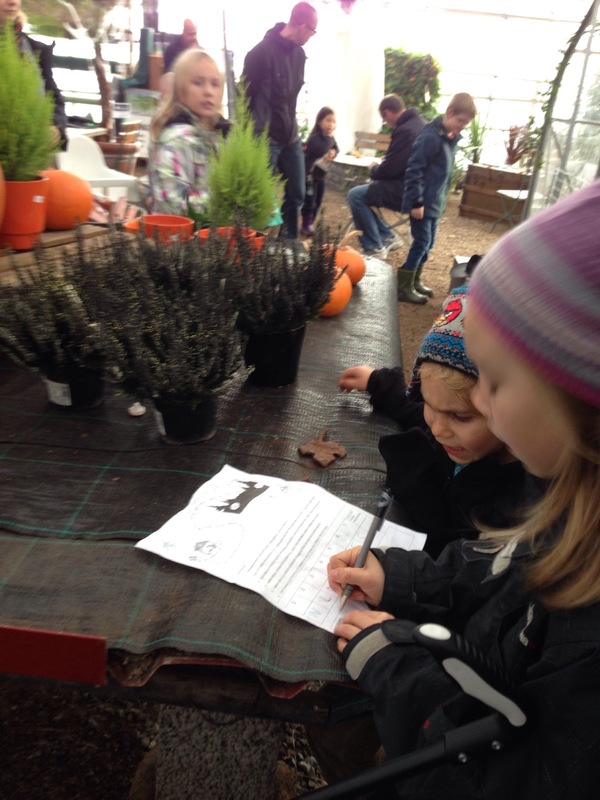 After three hours the girls had made 660kr for ‘Varlden’s Barn’ (Save The Children). 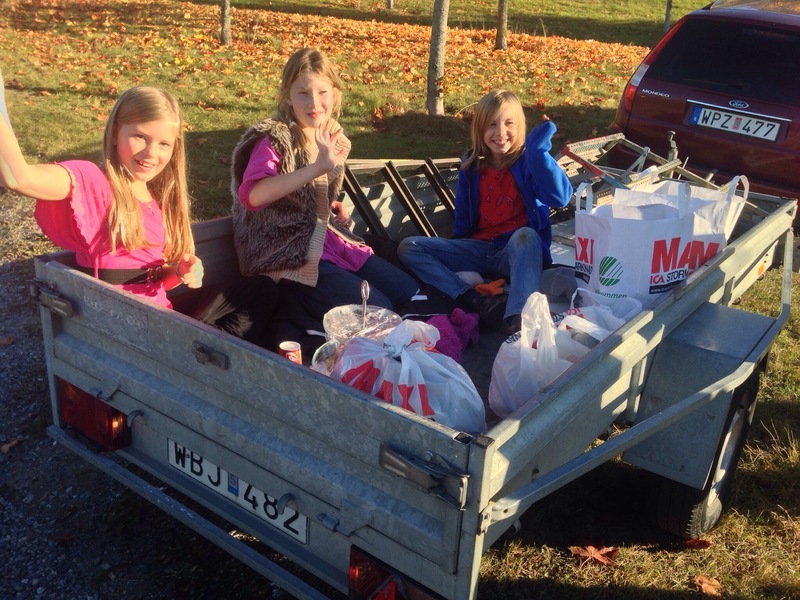 Plus they got to have a ride home in the trailer…! 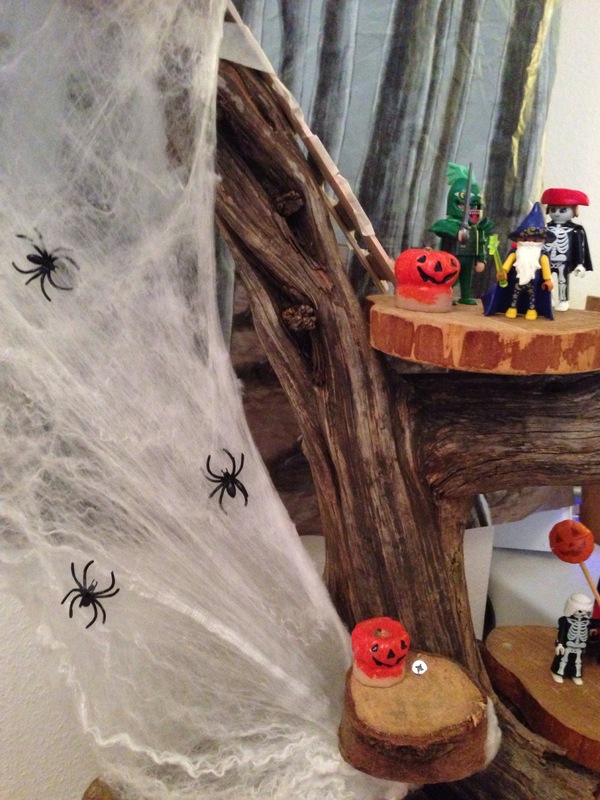 Posted in Everyday things.., Marvelous Maya's Creations, One Hundred Percent Child Initiated!